Last 14 September 2006, the Special Board of Maritime Inquiry (SBMI) of the Department of Transportation and Communications, through its Secretary, released its findings and recommendations on the largest oil spill in Philippines history. This SBMI report on the tragic incident that has affected four towns in Guimaras Island and two towns in Iloilo Province, thereby contaminating fishing grounds, beaches, sea-grass beds and seaweed farms, is a tragedy in itself. I am appalled by the deliberate haste with which the report was done in a matter of two weeks. This has resulted in a haphazard report, which has only raised more questions rather than answers. MARINA and Philippine Coast Guard (PCG) were found to have committed lapses in the performance of their duties. Mr. President, on paper these findings are all in order. But are they telling us the real story behind this tragedy? They are not. The MT Solar 1 was a vessel destined to create havoc. From the moment it entered Philippine waters, its seaworthiness had been severely compromised and prejudiced. Allow me now to tell the real story behind this tragedy. I shall begin it with a fact a ship is presumed to be built to be seaworthy. A vessel must have that degree of fitness which an ordinary, careful and prudent owner would require his vessel to have at the commencement of her voyage, having regard to all the probable circumstances of it. Thus, the degree of seaworthiness varies in relation to the contemplated voyage. Crossing the Atlantic calls for stronger equipment than sailing across the Visayan sea. It is essential to consider that once the necessary degree of seaworthiness has been ascertained, this obligation is an absolute one, i.e., the undertaking that the vessel is actually seaworthy. It is no excuse that the ship owner took every possible precaution to make her so, if in fact he failed. The government of the flag state. On all counts, the safety nets that should have prevented MT Solar 1 from sinking in the waters of Guimaras Island on 11 August 2006 failed. Mr. President, it was, in ordinary parlance, a systems failure. This failure was overlooked by the SBMI. We ask why? Is it being done to hide from the people the liabilities of the agencies in government, or is it a cover-up or an attempt to whitewash another maritime tragedy? At the time of the occurrence, MT Solar 1 was manned by eighteen (18) people led by its Master Captain Norberto Aguro. Two (2) of them remain missing and are presumed to have died with the sinking of the vessel. We now know that, while Captain Aguro had completed the Advance Training Program on Chemical Tanker Operations, he does not have Advance Training on Oil Tanker Operations which is required for the Master on board oil tanker. Thus, his Certificate of Competency (COC) limits him to serve on board chemical tankers only. He has had experience as Master on board foreign flagged chemical and LPG tanker vessels, but none on board an oil tanker. The SBMI in their report said that, this lack of training and qualifications of the captain of the vessel was further compounded by his making an erroneous decision to set sail from Guimaras despite the mildly inclement weather, and failing to ensure the vessels seaworthiness. Nearing the southern tip of Panay, the vessel developed a starboard list after being battered by waves (obviously wave heights in excess of her freeboard) that can damage and compromised exposed deck fittings such as vent valves, etc., Correctly, the captain seeked shelter in Iloilo but could not drop anchor as the windlass was grounded. So, afloat and drifting, the crew pumped out the chain locker and other spaces to bring the ship to even keel. I do not know if the captain satisfied himself that after pumping out to the vessel, what was the cause of the list or ingress of water. Did he deal with and feel safe enough to continue the voyage? It is my opinion that the vessel at that time had already sustained some structural failure not normally noticed except through an underwater inspection. The vessel should not have sailed without first carrying out repairs on the windlass and verifying the cause of the listing. The ship was no longer seaworthy by virtue alone of not being able to anchor because of the windlass deficiency. Quite often, against the better judgment of a Captain on the scene, pressures are brought to bear that compel the vessel to take short cuts and suffer the consequences. These can be the demands from the owner or cargo owners and oftentimes aggravated due to incentive bonuses to deliver the goods. Mr. President, this professional opinion, as well as other information that we have come into light, suggests that the sinking of the vessel was not due to her lacking a double hull. It is almost certain that water entered the cargo compartments or other spaces causing the vessel to lose buoyancy. Double hull vessels offer some protection but only in the event of shallow water grounding or minor collisions at slow speeds. This is especially true of small vessels such as our inter-island tonnage where the keel to inner bottom distances are not significantly deep. On the other hand, double hulled vessels are more prone to retain explosive gases in the void spaces and therefore more dangerous especially when carrying flammable and volatile petroleum products. Cataclysmic explosions can wreck a tanker and cause a major oil spill. Who is the real beneficial owner of the vessel? How was the vessel brought into the country? Was she chartered and if so, where are the enabling documents to allow for taxes and fees including a waiver to engage in cabotage trade? Was the vessel imported into the country? Was the vessel bareboat chartered to Philippine operators and if so, under what authority? Were the appropriate taxes such as the 4.5 % bareboat taxes paid? Sunshine Maritime Development Inc., does not own the vessel. They are only the disponent owners of the vessel. They are only lease purchasing it. According to the 24 August 2005 decision of the MARINA granting the Certificate of Public Convenience (CPC), MT Solar 1 is being leased from New Hinase Maritime S.A., for a period of only eight years, or up to December 2009. This is supported by the fact that, based on the records of French Classification Society - Bureau Veritas, the ship is owned by New Hinase Kisen Inc., and not Sunshine Maritime Development, Inc.
How can a ship that is of foreign registry ply Philippine waters carrying Philippine cargo owned by a corporation with substantial government interest? This act is a violation of section 6 of Republic Act 9295 which provides that, No foreign vessels shall be allowed to transport passengers or cargo between ports or places within the Philippine territorial waters, except upon the grant of special permit by the MARINA when no domestic vessels is available or suitable to provide the needed shipping service and public interest warrants the same. What were the considerations involved in allowing the vessel to carry cargo along Philippine waters? Is the exception now the rule? Mr. President, assuming that, the vessel was chartered under a bareboat program, the MARINA should still be held accountable for violating its own rules. Under MARINA Memorandum Circular no. 42 series of 1998, a company may be allowed to bareboat charter a maximum of two (2) vessels only, in excess of the two, the company must place an additional paid-up capital based on the size of the vessel. A qualification that Sunshine Maritime Development Corporation failed to comply. The owner of the cargo, PETRON, has been silent on how it engaged the vessel. Was the vessel time-chartered? Was it on a contract of affreightment? On a consecutive voyage charter? Or a single charter? In any case, any of these types of charters vests some control in PETRON as to the movement of the vessel, how to prosecute a voyage, where to load, where to discharge cargo, and even which type of cargo to carry and the quantities to load. The fact that, the SBMI has established that PETRON overloaded the vessel proves its liability. The New Hinase alias Solar I was found to be overloaded considering that it left Bataan with a draft of 5.1 meters, when it was only supposed to have a draft of 4.85 meters. Draft refers to the distance between the bottom of the tanker and the portion that is level with the water line. An increased draft indicates a heavier load. Petron was found to have overloaded the tanker because it was only supposed to fill it up to 98-percent capacity, but computations showed it loaded the Solar I up to 98.7-percent capacity. The tanker also lost its reserve buoyancy after it was allowed by MARINA to load more weight compared to that allowed by private classification society Bureau Veritas. The Bureau Veritas recommended load line was 1,220 millimeters, but the MARINA-approved certificate allowed the Solar I a mere a 700-mm load line. The lower the load line, the more weight the vessel could carry. This fact of overloading the vessel cannot be downplayed, in the light of evidence gathered by a remotely operated underwater vehicle that surveyed the wreck found a triangular hole on the left side of the New Hinase alias Solar I, along with scratches and open valves on its cargo hold. If PETRON allowed this overloading, did it also allow the pilferage of its own cargo ? As a corporation where our people has substantial interest in, this is a clear case of economic sabotage. Beyond the liabilities of the crew, the ship owner and the cargo owner, the greater liability rests on the agencies of government mandated by law to ensure compliance with safety standards and regulations. To the SBMI that conducted the investigation, the liabilities are mere lapses. This is condemnable. I shall not mince words in calling this report as another bureaucratic exercise of white washing and covering up the truth to evade liability. This tragedy has resulted in the death already of a child who died of inhaling the toxic fumes emitted by the oil spill, the death of two (2) crew members of the vessel, and substantial damages to the environment and the Filipino people, which are incapable of pecuniary estimation. These are not just lapses. These are serious crimes which deserve punishment. MARINA allowed the registration of the vessel without exercising due diligence. In Certificate of Vessel Registry Number 047182 dated 14 April 2005, we note that there is no mention at all that, the vessel was modified or converted. If only the MARINA had diligently done its duty, they could have easily seen that the New Hinase alias MT Solar 1 was a converted vessel. Its former names were New Hinase and Chie Maru no.8. According to Lloyds Register of Shipping Vessels, the MT Solar was initially a tanker in 1988 under the name Chie Maru no.8. In 1989, it was converted into a Chemical Tanker under the name New Hinase. From a Chemical Tanker, it was again reconverted into an oil tanker presumably in the Philippines. This is highly questionable and anomalous. Ang laki, ang haba at ang bigat ng barko ay pabago-bago. Is it just possible that the vessel during conversion may have had structural alteration, i.e. enlargement of tank spaces, removal of separation bulkheads and if so, were these carefully assessed to insure that the hull girder strength, structural integrity and stability characteristics were maintained or altered to meet the contemplated service? Were there tests performed after conversion, and sea trials conducted to ascertain that the statical stability, deadweight and loadline are in accordance with current class and state regulations. MARINA allowed the vessel to ply Philippine waters despite the fact that, it was already suspended from its class. This is highly anomalous. The New Hinase alias MT Solar 1 was suspended from its class by Bureau Veritas from December 29, 2005 to July 2006, and yet when it was suspended, it was allowed to travel and move cargo eighteen (18) times from the Port of Lamao, Limay, Bataan to various points of destination such as Iloilo, Cagayan de Oro, Davao, Cebu, Iligan and Leyte. Under normal circumstances, a vessel that has been suspended from its class should be grounded and not allowed to travel. This is consistent with international law provisions such as the United Nations Convention on the Law of the Seas (UNCLOS). Under UNCLOS, once a ship is registered, the flag State has certain duties laid out. In particular, under Article 94, the flag State must effectively exercise its jurisdiction and control in administrative, technical and social matters over ships flying its flag and take such measures for ships flying its flag as are necessary to ensure safety at sea..
By allowing the New Hinase alias MT Solar 1 to travel despite its suspension from class, MARINA directly violated section 22 of Republic Act 9295 which provides that, All vessels, whether newly built or previously owned, which are acquired on or after the effectivity of this Act be classified by a government recognized classification society on the date of acquisition prior to its operation in the domestic trade. MARINA allowed the registration of the vessel despite the fact that, it was only provisionally classed by international classification society Bureau Veritas. In Provisional Classification Certificate no. MNL0/JBL/20060125917 AM, the ship New Hinase alias Solar 1 owned by New Hinase Kisen Co., Ltd., was provisionally classed for its hull and machinery only from April 2006 to 6 October 2006. MARINA allowed the registration of a foreign owned vessel. All documents prove that it is foreign owned. In the Certificado Internacional de Arqueo or the International Tonnage Certificate no.69 0871 issued by the Panama Bureau of Shipping, the port of registry of the New Hinase alias Solar 1 is Panama. This is in violation of section 6 of Republic Act 9295 and its Implementing Rules and Regulations issued on November 30, 2004 which provides that, No foreign vessels shall be allowed to transport passengers or cargo between ports or places within the Philippine territorial waters, except upon the grant of a special permit by the MARINA when no domestic vessels is available or suitable to provide the needed shipping service and public interest so warrants. MARINA allowed the vessel to ply Philippine waters despite the fact that, its Cargo Ship Safety Construction Certificate had already expired. The Cargo Ship Safety Construction Certificate of the New Hinase alias MT Solar 1 expired on 07 June 2006. The oil spill incident occurred on 11 August 2006. This is in violation of Section 5, Rule VI of the Implementing Rules and Regulations of Republic Act 9295, which requires that, All ships are required to carry on board the relevant or applicable ship safety certificates as specified in Section 7.1.7 of Rule IV. Under Section 7.1.7, subsection a.2, a cargo ship safety certificate is required. MARINA allowed the overloading the vessel. The tanker also lost its reserve buoyancy after it was allowed by MARINA to load more weight compared to that allowed by private classification society Bureau Veritas. The Bureau Veritas recommended load line was 1,220 millimeters, but the MARINA-approved certificate allowed the Solar I had a 700-mm load line. The lower the load line, the more weight the vessel could carry. The MARINA officials who knowingly or unknowingly facilitated these acts should be held criminally and administratively liable. Our laws are clear. Section 3 of Republic Act 3019 otherwise known as the Anti-Graft and Corrupt Practices Act punishes and declares as unlawful, the act of causing any undue injury to any private party, including the Government, or giving any private party any unwarranted benefits, advantage or preference in the discharge of his official administrative or judicial functions through manifest partiality, evident bad faith or gross inexcusable negligence. Mr. President, all these woes besetting the maritime industry are the result as well of the apparent absence of any clear delineation of responsibility in maritime administration. It is so fragmented and there is competition as to different functional jurisdictions. The lack of inter-agency cooperation and coordination are the primary causes of why a safe shipping industry can hardly make strides forward. The overlapping of functions and competition among these agencies has only resulted in confusion. While the MARINA, under Republic Act 9295, is the principal government agency tasked for the development of the shipping industry, it is undermanned and not technically competent. There are 600 ports all over the country, and yet there are only a total of 500 people in MARINA. Mr. President, I submit that a comprehensive review on the maritime industry is in order. The absence of laws on safety standards in the Philippines shipping industry is not the reason why the maritime industry is being compromised, it is the lack of coordination and enforcement. And as the endless maritime disasters have proven, this has led to further corrupt practices which result in the loss of life and the reckless and wanton destruction of our environment and natural resources. 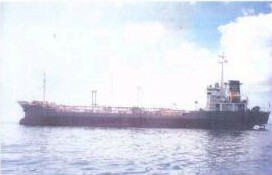 The OMBUDSMAN conduct a fact finding investigation on why MARINA allowed a foreign registered vessel managed by a fly by night company without any proven track record to transport cargo in Philippine waters, when there are legitimately registered Philippine vessels available; the circumstances on why it allowed a converted vessel to operate in Philippine waters; and why it allowed a vessel with a crew holding expired certifications and lacking training to operate an oil tanker. Pending investigation, I ask that the Ombudsman place the concerned officials under preventive suspension. The Bureau of Internal Revenue (BIR) and the Bureau of Customs (BOC) conduct an investigation on Sunshine Maritime Development Inc., particularly its payment of taxes and duties in connection with the entry of a foreign registered vessel. A Special Board of Inquiry be created. We cannot trust MARINA and the Coast Guard to make an independent determination of the cause and circumstances in the sinking of the vessel, because it is their negligence and corruption which allowed this incident to happen. Over the long term, I ask that the Senate seriously consider the passage of a bill creating an Oil Spill Liability Fund based on the United States Oil Pollution Act. Under the Oil Pollution Act of 1990, the owner or operator of a facility from which oil is discharged (also known as the responsible party) is liable for the costs associated with the containment or cleanup of the spill and any damages resulting from the spill. The Environmental Protection Agency's (EPA) first priority is to ensure that responsible parties pay to clean up their own oil releases. However, when the responsible party is unknown or refuses to pay, funds from the Oil Spill Liability Trust Fund can be used to cover removal costs or damages resulting from discharges of oil. The primary source of revenue for the fund will be a reasonable charge on per barrel fee on imported and domestic oil. Other revenue sources for the fund include interest on the fund, cost recovery from the parties responsible for the spills, and any fines or civil penalties collected. I believe that my distinguished colleagues will be particularly interested in the establishment of such a fund, Mr. President. There is much to do, and much that can still happen; and much will need to be undertaken if we are to make up for the executives having been caught so flat-footed by this disaster. I also ask that, the Senate act on the pending maritime conventions that has yet to be ratified. According to reports, there are forty eight (48) maritime conventions and treaties, and yet the Philippines has ratified only eleven (11). Finally, I ask that the Senate consider a review on the respective mandates, duties and responsibilities of the MARINA and the PCG. Republic Act 9295 has effectively emasculated the PCG, and yet the agency that took over its functions has proven to be ineffective. Mr. President, where the executive has substituted rhetoric for substantive action, not much can be done, except to deny the executive credit for behavior for which little if no credit is due. We have all marveled at how Filipinos from all walks of life have tried mightily, and sincerely, to do something, anything, to lend a helping hand. From hair to donations, everyone has been willing to do something. But it is governments job to harness our national energies, consolidate our national efforts, and provide direction to our official activities. The executive has focused, as it always does, on what is on the surface; in this case, the oil slick, without thinking of the many other things it ought to consider, and without a coordinating effort to consolidate the various actions that must be done. I would even go as far as saying that the Secretary of the Environment displayed instincts more environmentally sound than the chief executive. He said, and rightly so, that bacterial agents should be used for cleaning up oil spills. But the President of the Philippines has given more consideration to Petron, than she has to either our scientific or environmental communities; she has been more interested in appearing busy, than applying herself to coordination, evaluation, and action. The incident involving the New Hinase alias Solar 1 is a microcosm of our state of affairs. Whether it be the issue of political killings, human rights abuses, charter change and electoral reforms, the executive has chosen instead to just ride the waves and ensure its own political survival to the detriment of the people. So we must take up the slack; we must provide leadership where there is none; and we must look to the interest of our maritime industry, our confused and demoralized maritime authorities, and a frightened and outraged citizenry. We must lead; we must act; we must deliberate and be deliberate in doing what is required of us. In the end, this too shall pass and the unrighteous shall fall. Sen. Jamby Madrigal today strongly criticized the results of the inquiry on MT Solar 1 sinking that led to the Guimaras oil spill saying it had traces of a grand cover-up and a whitewash. According to the Senator, the SBMI report on the August 11 incident was haphazardly done in two short weeks thereby raising more questions rather than answers. Calling the findings of the inquiry catastrophic as the tragedy itself, she has called for a thorough unearthing of facts behind the incident. To the SBMI that conducted the investigation, the liabilities are mere lapses. This is condemnable. This tragedy has resulted in the death already of a child who died of inhaling the toxic fumes emitted by the oil spill, death of two (2) crew members of the vessel, and other damages to the environment and the Filipino people, which are incapable of pecuniary estimation. They are not lapses. They are crimes which deserves punishment, Senator Madrigal said. Under the law, MARINA officials who knowingly or unknowingly facilitated these acts can be held criminally and administratively liable. Section 3 of Republic Act 3019 otherwise known as the Anti-Graft and Corrupt Practices Act punishes and declares as unlawful, causing any undue injury to any private party, including the Government, or giving any private party any unwarranted benefits, advantage or preference in the discharge of his official administrative or judicial functions through manifest partiality, evident bad faith or gross inexcusable negligence. MARINA allowed the registration of the vessel without exercising due diligence. In Certificate of Vessel Registry Number 047182 dated 14 April 2005 , there is no mention at all that, the vessel was modified or converted. If MARINA had diligently done its duty, they could have easily seen that the New Hinase alias MT Solar 1 was a converted vessel. Its former names were New Hinase and Chie Maru no.8 . According to Lloyds Register of Shipping Vessels, the MT Solar was initially a tanker in 1988 under the name Chie Maru no.8. In 1989, it was converted into a Chemical Tanker under the name New Hinase . From a Chemical Tanker, it was again reconverted into an oil tanker presumably in the Philippines . MARINA allowed the vessel to ply Philippine waters despite the fact that, it was already suspended from its class . This is highly anomalous. The New Hinase alias MT Solar 1 was suspended from its class by Bureau Veritas from December 29, 2005 to July 2006, and yet when it was allowed to travel and move cargo eighteen (18) times from the Port of Lamao, Limay, Bataan to various points of destination such as Iloilo, Cagayan de Oro, Davao, Cebu, Iligan and Leyte. Under normal circumstances, a vessel that has been suspended from its class should be grounded and not allowed to travel. This is consistent with international law provisions such as the United Nations Convention on the Law of the Seas (UNCLOS). Under UNCLOS, once a ship is registered, the flag State has certain duties laid out. In particular, under Article 94, the flag State must effectively exercise its jurisdiction and control in administrative, technical and social matters over ships flying its flag and take such measures for ships flying its flag as are necessary to ensure safety at sea.. By allowing the New Hinase alias MT Solar 1 to travel despite its suspension from class, MARINA directly violated section 22 of Republic Act 9295 which provides that, All vessels, whether newly built or previously owned, which are acquired on or after the effectivity of this Act be classified by a government recognized classification society on the date of acquisition prior to its operation in the domestic trade. MARINA allowed the registration of a foreign owned vessel. All documents prove that it is foreign owned. In the Certificado Internacional de Arqueo or the International Tonnage Certificate no.69 0871 issued by the Panama Bureau of Shipping, the port of registry of the New Hinase alias Solar 1 is Panama. This is in violation of section 6 of Republic Act 9295 and its Implementing Rules and Regulations issued on November 30, 2004 which provides that, No foreign vessels shall be allowed to transport passengers or cargo between ports or places within the Philippine territorial waters, except upon the grant of a special permit by the MARINA when no domestic vessels is available or suitable to provide the needed shipping service and public interest so warrants. MARINA allowed the vessel to ply Philippine waters despite the fact that, its Cargo Ship Safety Construction Certificate had already expired. The Cargo Ship Safety Construction Certificate of the New Hinase alias MT Solar 1 expired on 07 June 2006 . The oil spill incident occurred on 11 August 2006 . This is in violation of Section 5, Rule VI of the Implementing Rules and Regulations of Republic Act 9295, which requires that, All ships are required to carry on board the relevant or applicable ship safety certificates as specified in Section 7.1.7 of Rule IV. Under Section 7.1.7, subsection a.2, a cargo ship safety certificate is required. MARINA allowed the overloading the vessel. The tanker also lost its reserve buoyancy after it was allowed by MARINA to load more weight compared to that allowed by private classification society Bureau Veritas. The Bureau Veritas recommended load line was 1,220 millimeters, but the MARINA-approved certificate allowed the Solar I had a 700-mm load line. The lower the load line, the more weight the vessel could carry. The Securities and Exchange Commission (SEC) to pierce the veil of corporate entity of Sunshine Maritime to determine its real owners and ensure prosecution under the Anti-Dummy Law. Senator Madrigal was quick to add that the incident involving the New Hinase alias Solar 1 is a microcosm of our state of affairswhether it be the issue of political killings, human rights abuses, charter change and electoral reforms, the executive has chosen instead to just ride the waves and ensure its own political survival to the detriment of the people. She urged her fellow Senators to take up the slack; to provide leadership where there is none; to look into the interest of our maritime industry, the confused and demoralized maritime authorities, and a frightened and outraged citizenry. We must lead; we must act; we must deliberate and be deliberate in doing what is required of us, Madrigal stressed. MARINA allowed the registration of the vessel without exercising due diligence. In Certificate of Vessel Registry Number 047182 dated 14 April 2005 , there is no mention at all that, the vessel was modified or converted. If MARINA had diligently done its duty, they could have easily seen that the New Hinase alias MT Solar 1 was a converted vessel. Its former names were New Hinase and Chie Maru no.8 . According to Lloyd’s Register of Shipping Vessels, the MT Solar was initially a tanker in 1988 under the name Chie Maru no.8. In 1989, it was converted into a Chemical Tanker under the name New Hinase . From a Chemical Tanker, it was again reconverted into an oil tanker presumably in the Philippines . MARINA allowed the registration of the vessel despite the fact that, it was only provisionally classed by international classification society ? Bureau Veritas. In Provisional Classification Certificate no. MNL0/JBL/20060125917 AM, the ship ? New Hinase alias Solar 1 owned by New Hinase Kisen Co., Ltd., was provisionally classed for its hull and machinery only from April 2006 to 6 October 2006. MARINA allowed the vessel to ply Philippine waters despite the fact that, its Cargo Ship Safety Construction Certificate had already expired. The Cargo Ship Safety Construction Certificate of the New Hinase alias MT Solar 1 expired on 07 June 2006 . The oil spill incident occurred on 11 August 2006 . 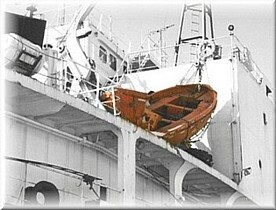 This is in violation of Section 5, Rule VI of the Implementing Rules and Regulations of Republic Act 9295, which requires that, “All ships are required to carry on board the relevant or applicable ship safety certificates as specified in Section 7.1.7 of Rule IV.” Under Section 7.1.7, subsection a.2, a cargo ship safety certificate is required. MARINA allowed the overloading the vessel. The tanker also lost its reserve buoyancy after it was allowed by MARINA to load more weight compared to that allowed by private classification society Bureau Veritas. The Bureau Veritas’ recommended load line was 1,220 millimeters, but the MARINA-approved certificate allowed the Solar I had a 700-mm load line. The lower the load line, the more weight the vessel could carry. A tanker which sank last month causing the Philippines' worst-ever oil spill might have been holed by another vessel while illegally off-loading at sea, investigators said Monday. Evidence gathered by a remotely operated underwater vehicle that surveyed the wreck found a triangular hole on the left side of the Solar 1, along with scratches and open valves on its cargo hold, a justice department official said. The 988-ton Solar 1 plunged to the ocean floor on August 11, releasing tens of thousands of gallons of oil that destroyed a marine reserve, ruined local fishing grounds and covered stretches of coastline in black sludge. Two crew members are missing and presumed dead in the accident, which a maritime inquiry blamed on overloading and the inadequate training of its captain, Norberto Aguro. The vessel was carrying 500,000 gallons of industrial fuel oil on board. Justice Undersecretary Fidel Exconde said the video evidence prompted a fresh inquiry into the possibility that its hull had been "punctured" by another ship. He said in a memorandum to Justice Secretary Raul Gonzalez made available to the press that video evidence "bolster the theory that another ship was travelling alongside Solar 1 when it sank and it probably caused the triangular hole in the hull." These findings "also point out the possibility that the unknown vessel travelling alongside Solar was engaged in [cargo stealing] operations," Exconde said. Exconde said the video evidence will be studied by prosecutors further. Cargo owner Petron Corp., meanwhile, denied the tanker was overloaded when it left the company's refinery in Bataan province. "Our records show that the loaded volume was 2.19 million liters or 98 percent of the ship's capacity of 2.24 million liters," the listed refiner's corporate secretary Luis Maglaya said in a letter to the Philippine Stock Exchange. Petron said it will "continue our clean-up operations and help in the rehabilitation of the affected areas" on the island of Guimaras, where the company said it has cleaned up 214 kilometers of shoreline of 1,588 tons of debris. But he added that the 700 millimeter freeboard the Marina approved was still within the load line convention. Marina engineer Bobby Carpio, who sits at the SBMI but also took the witness stand Tuesday, testified that the Bureau Veritas certificate designating the 1,220-millimeter freeboard was only valid for a single voyage, which was the tanker’s delivery from Japan to the Philippines. Carpio also said the original freeboard of the tanker was 550 millimeters, which was even lower than the Marina-approved one. Odi was also asked about the Solar I exceeding its designated draft, which refers to the distance between the waterline and the bottom of the ship, with a longer draft indicating extra weight. But Carpio said any overloading of the Solar I would be the responsibility of the captain and the refinery that chartered the tanker, which was the Petron Corp.
SBMI member Commodore Benjamin Mata, for his part, said he believes the reduction of the freeboard, even while within allowable limits, “definitely” contributed to its sinking. But a member of the Special Board of Marine Inquiry (SBMI) said allowing the Solar I to carry a larger load affected its stability and contributed to its sinking on August 11. The sinking of the tanker, which was carrying 2.1 million liters of oil, triggered one of the worst oil spills in the country, which continues to affect Guimaras and Iloilo provinces. Marina naval architect Carlos Odi testified on Monday that the tanker's agency-approved freeboard, which refers to the distance between the main deck of the vessel and the waterline, was within allowed limits. He acknowledged the freeboard also allowed the tanker to carry a larger load and, thus, earn more revenue. But the Marina-approved freeboard was lower than that specified by the private classification society Bureau Veritas, which inspected the tanker. Asked during hearing what he thought was the effect of adding more cargo onboard the Solar I, Odi answered: "I think that is the revenue." One of the four Japanese incorporators of Sunshine Maritime Development Corporation (SMDC), owner of the ill-fated Solar 1 tanker that sank off Guimaras island last August 11, on Friday dissociated himself from the disaster and the ensuing oil spill saying he has divested all his shares in the shipping firm as early as January this year. Speaking through his Filipino and Japanese interpreters, Hiroyasu Yamaguchi told the Department of Justice (DOJ) that he has already sold all his stock shares for P1 million to SMDC president Clemente Cancio. Aside from Yamaguchi, the three other Japanese incorporators are Mototsugu Yamaguchi, Tomoki Tsubomoto and Hiromi Irishka. At the continuation of the hearings on the oil spill, Yamaguchi, listed as director of Sunshine Maritime in the articles of incorporation, presented to the DOJ panel a notarized document that he had sold his shares for the same amount that he had put up for the company's start-up capital in 2001. The sale of the shares coincided with his 65th birthday, in which he considered himself retired. He also said his other businesses were not doing so good so that he decided to divest his shares. "I turned 65, my physical condition is not good. I have hypertension and have a hearing problem. My mother is living alone, so I decided to sell my shares. I no longer have any relation with the company, but if I could do anything to help the problem, I will do so," he said. DOJ Undersecretary Ernesto Pineda, which heads the task force, asked him why the Securities and Exchange Commission (SEC) was not furnished a copy of the notarized document. The panel also showed a copy of Sunshine's list of officers for 2005, in which Yamaguchi was listed as treasurer. Under the Anti-Dummy Law, foreigners are prohibited from holding positions in a company higher than director, but Yamaguchi merely said he was not aware of the policy. "Ignorance of the law is no excuse. The penalty for violation of the law is five to 15 years' imprisonment," said DOJ Undersecretary Fidel Exconde, a member of the panel, pointing out that the 1987 Constitution also allows only up to 40 percent of a domestic company's capital to be provided by foreigners. Exconde further said of the P5.5 million in start-up capital of SMDC, P4 million, or 73 percent of this came from the four Japanese incorporators, who put in P1 million each. The DOJ also cast doubt on the authenticity of Yamaguchi's notarized document of sale of shares and his claim that his businesses weren't doing well. He said Sunshine itself was spending P6 million a month for oil alone. Pineda said the deed of sale submitted by Yamaguchi appeared to be so new that it could be fake. "I wonder that this paper was very new. I wonder if you really signed this in January 2006," he asked Yamaguchi. Earlier, the DOJ task force has put the blame on the oil spill on Solar I Captain Norberto Aguro and his crewmen. Petron Corporation officials may be liable for the civil offense of negligence in choosing an unsuitable oil tanker. Meanwhile, Maritime Industry Authority (Marina) administrator Vicente Suazo, Jr., who also testified Friday, said it is the responsibility of the Philippine Coast Guard (PCG) to conduct pre-departure inspection on all sea vessels before leaving a port. "The Coast Guard is enforcing the pre-departure inspections of the vessels on our behalf as provided under the Memorandum of Agreement that we had entered with them because we have no enough personnel to do it," Suazo said. Suazo said the vessel owners, on the other hand, are the ones who should make sure that they are not hiring ship captains with expired license. "The owners of the vessels are the ones hiring and it is their responsibility to make sure that the ship captains that they hire have an existing license," he said. Owners of the M/T Solar 1 oil tanker could face problems in paying off claimants of the Guimaras oil spill due to possible rejection of their insurance claims, TV Patrol World reported Wednesday. Stronghold Insurance Company Inc. (SICI) cancelled the hull and machineries insurance policy of Solar 1 after the tanker's owners, Sunshine Maritime Development Corp., failed to settle the premium. The report said SMDC could also forfeit its shipping liability claims for violating seafaring laws. Solar 1, carrying at least two million liters of oil, sank off Guimaras Islands last August 11. Officials said the oil spill had polluted at least 220 kilometers of coastline, fishing grounds, marine reserves and tourist spots. Hundreds of fishermen in the island were deprived of their livelihood because of the oil spill and hundreds of Guimaras residents were hauled to evacuation centers to avoid the toxic hazards brought by the spilled oil. SICI executive vice-president Romulo de los Reyes said SMDC took a hull and machineries policy worth P20 million for the Solar 1 last February. He added that SMDC failed to settle its premium worth P211,990. "We have to have payment for the policy so it will be in effect," he said, adding that SICI had already informed the Insurance Commission about the rejection of the claim. SMDC president Clemente Cancio said the company will file charges against the insurance firm. "We used to be late in paying the premium but it was never a problem until now," he said. be rejected after SMDC violated seafaring laws. The rule states that "there shall be no right of recovery of any claim from the Association if it arises out of willful misconduct on the part of the insured." SMDC earlier admitted before a Special Marine Board of Inquiry that it allowed Captain Norberto Aguro to man the Solar 1 despite his failure to renew his license. SMDC rejected the TV Patrol World report, saying that the insurance company had already sent representatives to Guimaras to assess the claims. The Special Board of Marine Inquiry on Wednesday said it is eyeing oil smuggling as the possible cause of the sinking of the Solar 1. Two cargo surveyors hired by Petron Corp., who chartered the Solar 1, told investigators that some vessels steal bunker oil from oil tankers and sell it illegally. The oil smuggling theory surfaced after the board viewed footage of the sunken tanker, which showed extensive damage to its side. One of the holes on the ship's hull was triangular, which a board member said could have been caused by a collision with the anchor of another vessel. Surveyors and the ship's captain denied the allegation. The board also questioned why the hatch cover that led into the compartments was unsealed. Cargo surveyors insisted that all the valves and covers were locked and sealed before they set sail. The board clarified that oil smuggling is only one of the many possibilities that it is studying on the possible cause of the tanker's sinking. President Arroyo on Wednesday ordered the Department of Justice to build an "air-tight" case against the captain of the sunken M/T Solar 1 and officials of Petron Corp. and SMDC. "No one culpable in this national tragedy shall walk away scot-free," Press Secretary Ignacio Bunye said in a statement. He said that the filing of cases against people allegedly responsible for the oil spill should be a reminder to oil companies and firms engaged in oil and chemical transport to cooperate with government agencies and institutions about their operations. Mrs. Arroyo also announced that Reserved Officer Training Corps cadets and college students will soon join in cleaning up the coastlines tarnished by the oil spill. She signed Executive Order 559 creating the Metro Iloilo-Guimaras Economic Development Council, which will be composed of local government officials, regional heads of departments and other government offices and representatives from nongovernmental organizations. She said the development council would consolidate and coordinate efforts, services and resources of local and regional officials that could lead to the rehabilitation of Guimaras and nearby provinces suffering damage from the oil spill. She said that on Thursday the task force head, Defense Secretary Avelino Cruz, would reveal the recommendations of the Japanese survey ship on how to prevent the remaining oil in the Solar 1 from leaking. In Bacolod City the president of the Philippine Reefs and Rainforest Foundation scored Petron officials for declaring that the worst of the Guimaras environmental disaster "is behind us." In a press conference, Gerry Ledesma said the danger that the tanker could break and release more oil "remains imminent and can pose danger to our prized reefs." Ledesma said under threat are the Sulu Sulawesi region, the Tubbataha Reef in Palawan and the reefs in nearby southern Negros Occidental which directly faces Guimaras Island. Negros officials led by Gov. Joseph Maranon have passed a resolution demanding the "unconditional removal" of the sunken tanker. Jose Campos, Petron vice-president for marketing, said they have yet to receive the official report from the survey ship Shinsei Maru. There are three options for salvaging the Solar 1. One is to refloat the tanker, another is to siphon the remaining oil from its hold, and the third is to entomb the wreck in sand or cement. Campos said a salvage tanker with siphoning equipment might not be available in the region and they will have to scout one in Europe. THIS September, the Philippines once again joins the other members of the community of nations in the annual observance of Cleanup and Green the World with the Coastal Cleanup of the International Maritime Alliance. President Arroyo has just declared a state of national calamity with the recent sinking of MT Solar 1 off Guimaras Island on August 11 followed by a similar water pollution disaster in Subic. A united collective effort for the coastal cleanup is essential. But the sinking of Solar 1 and the subsequent oil spill could have been prevented, the release of the oil controlled, and the environmental and health impact easily mitigated through compliance with international antipollution maritime laws and local requirements; speedy disaster-control response by authorities and Petron; and the use of available science and technology to retrieve the remaining oil in the hold of the ship and the cleanup of the oil spill area. Disregarding these specific guidelines only shows why the Philippines is prone to disasters. The International Convention for the Prevention of Pollution from Ships, also known as MARPOL Convention of 1973 and 1978, is the main international convention covering the prevention of pollution of the marine environment by ships from operational or accidental causes. MARPOL Convention requires all transoceanic tankers worldwide to be double-hulled and double-bottomed by 2008, and all interseas tankers like Solar 1 by 2015 to prevent spillage of oil, chemicals and other toxic and hazardous material into the seas. Of the 7,000 tankers in the Philippines, about 400 are oil tankers and none are double-hulled. President Arroyo had ordered on August 28 a spot check of all 214,000 tankers plying Philippine seas to verify their seaworthiness. She also instructed Transportation Secretary Larry Mendoza not to wait until 2015 to force interseas tankers to be double-hulled and double-bottomed as MARPOL requires but instead push for a 2008 national deadline. The Chief Executive also ordered the establishment of sea lanes where the ships carrying dangerous chemicals and oil would be forced to pass, away from tourist and economic centers. President Arroyo’s forceful order for earlier and immediate compliance with MARPOL standards for rankers and sea lanes is the first step to prevent another oil tanker spill. At the Special Marine Board of Inquiry (SBMI), it was established that the company that owns MT Solar 1 violated Maritime Industry Authority (Marina) rules. The cavalier attitude of tank owners and crew to their dangerous cargo were crucial environmental health and accident risks. The Department of Justice said it will determine if Sunshine Maritime violated the antidummy laws, which limit foreign participation in key industries as prescribed by the Constitution. “It appears that the Japanese own the ship. The incorporation papers are in Japanese. Sunshine Maritime’s four Japanese directors’ names appear in the Japanese firm’s articles of incorporation,” it declared. Because of this disturbing pattern of Marina and even rules of the Securities and Exchange Commission being flouted by both oil tanker owner and crewmembers, it was a wise move by President Arroyo to order a review of the licenses of all ship captains and bar those unqualified from sailing to avoid future sea disasters, especially with oil and hazardous cargo tankers. It is disturbing to note that Sunshine Maritime, with a US$600-milliom insurance as required by Petron in its contract with MT Solar 1, and a multibillion decades-old oil-corporation like Petron, took 20 days before bringing in this primal requirement to locate, siphon and/or float the sunken tanker. As such, the three-week-old oil leak has taken a toll on the environment and the many plant and animal life that thrive in it. Mangroves expert Resurreccion Sadaba said fish, mollusks and other marine organisms as well as coral reefs have started dying within the roughly 1,000-hectare Taclong National Marine Reserve which took a direct and immediate hit when the tanker sank. Seedlings and saplings among 90 hectares of mangrove thickets, vital shelters for fish fry, were already showing signs of withering after being suffocated by up to a meter of the bunker oil spill. It would probably still take six months to two years before the mass destruction of mangroves are visible. Environmental economist Rodelio Subalde said the Solar 1 damage was not limited to goods like fish stocks. It could have an impact on generations of fishermen. “It will entail a huge environmental cost such that the destruction in relative terms to major spills like the Exxon Valdez could be close,” Subalde said. Reynaldo Depasucat, chairman of the Negros Oriental Sangguniang Panlalawigan committee on environment and natural resources, said that there is no reduction of fish catch but fears of oil contamination have brought down sales. The Fisherfolk Movement-Philippines said Negros Occidental is next to Iloilo City in having the highest municipal marine production at 35,260 metric tons in 2005> It has expressed fears daily fish catch will suffer a drastic drop as Western Visayas braces itself for the ill effects of the Petron/Solar 1 oil spill. NUEVA VALENCIA, GUIMARAS -- President Gloria Macapagal-Arroyo yesterday directed the Department of Justice (DoJ) to ensure an airtight case against those found liable for the massive oil spill that hit this island. “As we clean up the coasts and coves of Guimaras with all the intensity we can muster, we will make sure that there will be no whitewash in ferreting out the truth behind the accident,” the President said at the opening of a meeting of the National Disaster Coordinating Council and Task Force Guimaras at the Raymen beach resort. “No one culpable in this national tragedy shall walk away scot free,” she said. Justice Secretary Raul Gonzalez said in a press briefing that Petron Corp. officials could be charged with civil liabilities for the oil spill, considered the worst in the country’s history. He said Petron was aware that the captain of the MT Solar 1, Capt. Norberto Aguro, had three previous violations. Aguro was even ordered replaced but instead an auxiliary captain was assigned to the tanker, he said. Petron chair Nicasio Alcantara said the company was leaving the findings to the investigating bodies and said it would cooperate in the probe. A DoJ task force formed to look into the criminal liabilities of parties behind the sinking and oil spill has confirmed findings of the Special Board of Marine Inquiry (SBMI), which is conducting a parallel investigation. In Manila, the SBMI said it would look into the possibility that another vessel caused the hole and dent on the sunken tanker, as revealed by video footage taken by a remote-operated vehicle of the Japanese survey ship Shinsei Maru. Board member Commodore Benjamin Mata, who chaired yesterday’s hearing, told reporters that the hole and dent did not seem to have been caused by waves, especially since the classification society that inspected the Solar I had attested that the tanker’s structure was sound. “From what we heard, nobody has said the tanker collided with something or they had an experience that could have caused the hole to form. But from what we saw of the hole, it was a big one that could not have formed because of waves hitting the ship. If the tanker was hit by waves, a triangular hole would not have been formed,” he said. SBMI chair Rear Admiral Danilo Abinoja had earlier said it was unlikely that the hole caused the tanker to sink because it was on the port side. The tanker listed on its starboard side before it sank, he said. Mata said the board would determine if another vessel could have come near the tanker and collided with it because of the rough seas. “This is all theory on our part. It’s sad that the surveyors said that one of them was sleeping while in Iloilo and the other surveyor was dizzy and could not care about what was taking place around him,” he said. In yesterday’s hearing, the two cargo surveyors hired by Petron, Anthony Fallet and Raul Melaya, were asked if they had noticed or heard something bumping against the ship. Both said they did not. They also said they had not known of any pilferage operation involving the Solar I wherein another vessel would sidle alongside the tanker and siphon off part of its fuel cargo. In Bacolod City, the Negros Occidental Provincial Peace and Order Council and the Provincial Disaster Coordinating Council on Tuesday passed a resolution stressing their “unconditional” demand for the removal of the tanker and its cargo from the site where it sank off. ILOILO CITY ? Experts will come out with their recommendations on what to do with the sunken tanker Solar I by tomorrow, the Coast Guard said yesterday. "They’re still studying it (the underwater footage)," Coast Guard commander Vice Adm. Arthur Gosingan said yesterday. "The findings and the recommendations will be in by Friday at the earliest." At Malacanang, President Arroyo vowed yesterday that there will be no whitewash in the investigation into the oil spill that devastated vast fishing grounds and marine reserves off Guimaras island. "As we clean up the coast of Guimaras with all the intensity we can muster, we will make sure that there will be no whitewash in ferreting out the truth behind the accident," she told Guimaras local officials. The President ordered Justice Secretary Raul Gonzalez to "ensure an airtight case" against those liable for the oil spill, which has damaged about 220 kilometers of coastline, 450 hectares of mangroves, 1,144 hectares of marine reserves and 116 hectares of seaweed plantations. Mrs. Arroyo said the disaster has been effectively contained but the cleanup will be intensified with the help of volunteers, including students, from nearby provinces. "It will take more than an oil slick to sink this island," she said on her third visit to Guimaras. "Together we will wipe away this smudge to bring back the smile on the face of the people of Guimaras," the President said. A decision will be made soon on what to do with the tanker and its remaining cargo, she added. On Tuesday, justice officials recommended the filing of criminal charges for negligence against Norberto Aguro, the tanker skipper, and Clemente Cancio, president Sunshine Maritime Development Corp., the vessel’s owner, in the deaths of two of the 20 crewmen and the damage from the massive oil spill. The owner of the spilled oil, Petron Corp., the country’s largest oil refiner, could face civil liability, Justice Undersecretary Ernesto Pineda said. Gosingan said John Walker, the expert hired by Protection and Indemnity Club, the insurer of Solar I, told him that they need time to view the footage of the entire underwater survey conducted by the remote-operated vehicle Hakuyo 2000 last week. "It’s a 12-hour tape, you know," he said. "So he (Walker) will have to study the entire tape." Gosingan said the underwater survey was just the first phase, and that they have yet to come up with what to do with the ship. "We will discuss the options once the findings and the recommendations have come in," he said. "We have to study thoroughly on what is to be done." It is certain that there will be a salvage ship that would be deployed for Solar I, he added. Gosingan said some 200,000 to 250,000 of the 2,000,000 liters on board Solar I have already seeped out in the past three weeks since the tanker sank on Aug. 11. "There are globules coming out," he said. Gosingan said the PCG has also consulted with a Norwegian salvaging firm on how to refloat sunken ships. "That would give us an idea on how to support such an operation," he said. Meanwhile, Gosingan said the PCG will continue to search for the two missing crew members of Solar I, although no bodies were found during the underwater survey. "We are still looking for them," he said. "For as long as they are not yet located, we have to assume that they’re still alive." Residents of a coastal barangay in Oton town in Iloilo turned over to the Regional Disaster Coordinating Council a small piece of yellow pad found inside a bottle which was washed ashore. The letter writer claims that he was one of the survivors of Solar I, and that he is marooned on a remote island, and is asking for help. In the meantime, Solar I, which lies off the southern coast of Guimaras, continues to leak oil into the sea. ‘Petron won’t shirk from responsibility’ In Bacolod City, Jose Campos, Petron vice president for marketing, said the company will not shirk from its "moral and social responsibility." "We will be in Guimaras for as long as it takes, even if it takes five years or more to repair the damage done," he told reporters yesterday. "It is regrettable that we have initially failed to clearly communicate our response efforts, but the oil spill continues to be a matter of serious concern for Petron," he said . Petron has not been remiss in its moral and social responsibility towards Guimaras and other areas in Western Visayas affected by the oil spill, he added. Campos denied allegations that Petron has passed on the blame and responsibility to Sunshine Maritime Development Corp. and insurer, Shipowner’s Mutual of Luxumbourg. "It is not something that we can pass off to anyone else," Campos said. "Petron remains serious and committed and they will be in Guimaras for as long as it takes. The good name that Petron has built up over the years has been affected. We have worked hard and we will continue to work even harder to resolve the situation." On calls to boycott Petron products, Campos said this will not solve the problem. Stronghold Insurance Company Inc. (SICI) cancelled the hull and machineries insurance policy of Solar 1 after the tanker's owners, Sunshine Maritime Development Corp. (SMDC), failed to settle the premium. Another insurance firm based in Luxembourg could also refuse insurance worth $300 million after the ship's owners allowed an unlicensed captain to man the vessel. be rejected after SMDC violated one of the insurance company's rules on exclusions. SMDC earlier admitted before a Special Marine Board of Inquiry that it allowed Captain Norberto Aguro to man the Solar 1 despite failing to renew his license. SMDC, however, rejected the report, saying that the insurance company had already sent representatives to Guimaras to assess the possible amount of damages. Representatives of the international service management company that inspected the ill-fated oil tanker MT Solar I on Wednesday testified that the vessel passed all its standards for seaworthiness earlier this year. Officials of France-based Bureau Veritas (BV) made the statement after finally making an appearance before the Board of Marine Inquiry (BMI) investigating the massive oil spill in central Philippines. "Based on last attendance on board and all inspection recorded from January to April 2006, in behalf of BV, the vessel (was) structurally fit," said Felicito Quimpo, BV senior surveyor. In his testimony, Quimpo noted that the MT Solar I was given a class symbol of 1 or I, which means the vessel fully complied with all BR requirements during the inspection. According to its website, Bureau Veritas specializes in quality, health, safety and environment management. It utilizes a "network that covers 140 countries and includes 600 offices and laboratories." The BMI last Monday expected Bureau Veritas officials to appear at the investigation, but the latter failed to do so. Commodore Benjamin Mata, a member of the board, then raised suspicions that there was "something they (Bureau Veritas) are hiding." On Wednesday, Quimpo apologized to the BMI for failing to attend the previous hearing. He said the BV office in the Philippines was unable to receive the first subpoena on time. The firm received the second subpoena by fax but its chief executive for BR-Phils, Ming-Chang Wu, was out of the country. The executive is due to return on September 10. Quimpo noted that Sunshine Maritime Development Corp. (SMDC), owner of the MT Solar I, has yet to pay BV for the last inspection. He refused, however, to disclose how much Sunshine owes them. SMDC should have settled their dues, Quimpo said, after the receiving an invoice for the completed inspection. The BV official said SMDC president Clemente Cancio was probably still busy attending to matters related to the oil spill. Last Monday, the Philippine Trigon Shipyard similarly attested that the MT Solar I was seaworthy. Trigon is the Cebu dry-dock from which the tanker had come out in February this year. It said the ship's construction either met or exceeded standards set by the non-profit International Association of Classification Societies (IACS). A dry docking superintendent for Sunshine Maritime Development Corp. (SMDC), owner of the MT Solar I, also attested that the vessel was seaworthy when it was inspected on January 7 to February 24. However, the BMI said then that the SDMC staff should have been able to detect signs of "wear and tear" at the vessel. MANILA -- For having an expired license, overloading his vessel, and violating practically every rule in the mariner's book, the captain of the ill-fated MT Solar I that sank off Guimaras Island last August 11 must be held liable. But aside from Captain Norberto Aguro, the Department of Justice (DOJ) also recommended the filing of criminal and civil charges against Clemente Cancio, president of Sunshine Maritime Development Corporation (SMDC), owner of Solar I. In the initial findings of the DOJ fact-finding task force chaired by Undersecretary Ernesto Pineda, the ship captain and ship owner appeared to have violated several laws like the Corporation Code (Batas Pambansa 68), the Anti-Dummy law, Clean Water Act, Domestic Shipping Act, Revised Penal Code on reckless imprudence resulting in homicide and damage to property, and the National Internal Revenue Code. Two crewmembers remained missing after the sinking of the vessel. Pineda said the penalties for violation of those laws could be imposed on erring directors, managers, and officers of SMDC and Petron. The report of the DOJ panel will be submitted to the President. "There is criminal negligence on the part of Captain Aguro and crew members; criminal and civil liability of officers of Sunshine Maritime Development Corporation for torts; and civil liability of the officers of Petron Corporation," he said. He said in the matters of torts and damages, especially when death occurred, there is a presumption that the vessel, the captain, and the crewmembers are at fault unless they are able to present evidence to prove otherwise. During the panel inquiry, Pineda said Aguro was defiant in not admitting his responsibility for the sinking of the vessel. "According to him, what he did is right. He said the vessel was sinking downward because of the volume of water inside so he pumped it out to balance the vessel. But instead of anchoring the ship at the nearest port in Iloilo, the captain decided to proceed with his voyage towards Zamboanga City," Pineda said. Vice Admiral Arthur Gosingan, commandant of the Philippine Coast Guard, told the panel that had the vessel been anchored and Aguro declared a so-called "marine protest," the PCG would have been able to inspect the vessel to see if it was still seaworthy. "Since there was no protest made, the PCG was not informed so they were not able to provide assistance. The accident could have been prevented," Pineda said. The DOJ also pointed out Aguro's own admission that his license has expired since January 31, 2002. Although he has a master mariner's certificate, there was a caveat in it that states that he may only be able to navigate a chemical tanker but not an oil tanker. "Solar I is a bunker oil tanker but Aguro is a holder of a chemical tanker certificate. The qualifications are not the same for running two vessels," said the DOJ panel. On top of his expired license, Aguro also appeared to have overloaded the vessel when he agreed to board four personnel of Petron to accompany the cargo to Zamboanga City even though its capacity was only 16. The captain also on three occasions did not make use of a tugboat, which will guide the vessel in docking, a violation of the Marine rules, the DOJ panel found out. Pineda said Sunshine Maritime's liability lies with its failure to reprimand its captain and for possible violation of the anti-dummy law for having the Japanese incorporators shoulder the bulk of its paid-up capital of P5 million. On the other hand, Petron's liability stemmed from its failure to ensure the safety of the ship that it chartered. "We can't attach any criminal liability on Petron, only to the captain because he is directly involved. Petron is merely the one that chartered the ship and the owner of the cargo but it is liable for negligence in hiring the wrong vessel because it has the obligation to see to it that the vessel is seaworthy," he said. The DOJ will summon the other crewmembers of the sunken ship for what could be the last panel inquiry on Friday to determine the physical condition of the captain, whether he was sleeping or drunk at the time the vessel was said to be sinking, as reported in the newspapers. The panel will also question the PCG and Maritime Industry Authority (Marina), which regulate the operations of shipping firms and authorized Aguro to proceed with his sea voyage despite his expired license. Meanwhile, Petron distribution manager Rolando Salonga said the company has no direct control over the personnel that manned the sunken Solar I.
Salonga said the oil firm, in its dealings, only coordinates with the owner of the vessels that they are chartering. He also said it is SMDC that has direct control over the crews and ship captain of Solar I. "We have an accreditation process. Our requirement is to check the technical capability and financial status of the ship owners. We don't have a direct control over the crews and captain of the Solar I vessel because they are hired by the ship owner. We only coordinate with the ship owner," he said of Sunshine Maritime, which has been ferrying their fuel cargoes since 2001. But even if Petron has no supervisory powers over the tanker and its crew, Salonga said it conducts precautionary measures in ensuring the safe delivery of its fuel to the intended destinations. Among the measures that they are undertaking are: the conduct of ship inspections prior to loading time; requiring the ship owner to submit the Maritime Industry Authority (Marina) certificate of insurance; Marina vessel registry and cargo ship safety equipment, which certifies that the ship comply with the international safety standards and the vessel particulars and sea worthiness issued by the ship owner. Salonga admitted to the DOJ panel that they only check once every six months if the license of the ship's crews and its captain are up to date. "The actual and physical inspection is part of our internal procedure and it is a one-hour process being conducted by a tending surveyor, vessel representative, and the chief mate. Our inspection of the licenses of the crews is not made every voyage. It is conducted every six months. That is our procedure," he said. He said the ship owner informed Petron that there will be a delay in the delivery because of rough seas. "They said the vessel will temporarily shelter and wait for the weather to normalize so that they could go on with the trip," Salonga said. Salonga admitted to the DOJ panel that petroleum products are dangerous cargoes, which is they implement strictly safety measures for each delivery. Peter Paul Shotwell, supply, operations and planning manager of Petron Corporation, said other oil industry players are utilizing the services of the Sunshine Maritime Company that owns and operates Solar I.
Shotwell declined to name the other industry players but said when one company gets a volume of supply and wants to send it out immediately, they usually hire vessels that are readily available. "But we re-check everything before we hire them," he said during the weekly Kapihan ng Bayan at the Sulo Hotel in Quezon City. He added that it is not yet sure at present how the remaining oil found in the sunken vessel would be retrieved but they are closely coordinating with authorities. Defense secretary and Task Force Guimaras chairman Avelino Cruz Jr. said he has already gotten the commitment of Petron that they would exert all efforts in rehabilitating and restoring Guimaras and he continues to remind them of that commitment. "Petron has committed that they will exert all efforts, spend all resources to restore and rehab Guimaras to as close as possible to what it was originally," Cruz said. He said the government had initially released P10 million to Guimaras, P5 million to Iloilo, P5 million to Negros Occidental, and P5 million to the University of the Philippines-Visayas and they are willing to release more to ensure that clean-up operations and relief assistance to affected residents would continue. Cruz said they would have it reimbursed later by Petron. He also said part of the immediate assistance extended to the affected residents is alternative livelihood through the Department of Agriculture (DA), which would provide the affected families with at least four piglets, 10 native chickens, and seedlings for vegetables and hybrid corn. The DA Region 6 had initially identified 120 families who would receive the assistance this week. Cruz said aside from this, the World Wildlife Fund (WWF) had recommended that since majority of the affected residents are fishermen, they should be taught how to improve their fishing techniques. The Bureau of Fisheries and Aquatic Resources (Bfar) had also sent 10 motorized bancas to enable the fishermen to fish in areas far from the oil spill. They have also raised from P200 per day per person to P300 per day per person the cash given to the volunteers under the Cash for Work program. This would be reimbursed with Petron as well. Cruz urged local residents to consider filing insurance claims for the oil spill, as representatives of the International Oil Pollution Compensation (IOPC) and the Protection and Indemnity Insurance (PII) would be conducting seminars from September 5 to 8 in Guimaras. The Adelaide Zoo based in Australia would also be arriving in Guimaeras soon to setup a wildlife rescue center to help treat and rehabilitate the affected and "oil-covered" marine animals. This would be part of the environment department's rehabilitation program, which includes replanting mangroves and rehabilitating sea corals and sea grass. Science and Technology Secretary Estrella Alabastro, for her part, said a Coast Guard boat is also set to arrive in Guimaras to bring in more coconut husks from Romblon to help absorb the oil slick. Alabastro also said the coconut husks are better than human hair, which would be more difficult to contain. Cruz defended the use of chemical sprayers or dispersants to stop the oil sleek, saying it was ensured to be safe before it was used. He said the Japanese Coast Guard, in its initial report, said the use of dispersants is effective and safe and without any side effects to marine life. Cruz said he is expecting a formal report, including recommendations, in the next two days. He said the recommendations would also include how the remaining containers of oil would be treated. He said the initial report showed that it is feasible to have it siphoned off because the oil is "not yet coagulated or solidified". He said while it would be more expensive, he favors siphoning it off. Cruz said at least two barges are on standby in Guimaras along with five dump trucks that would collect the oil sludge and the waste products that would be transported to a cement firm in Misamis Oriental. He assured that the Coast Guard had already inspected the barge and ensured that the crew qualified and the checked the seaworthiness of the vessels to ensure that it would reach its destination. President Gloria Macapagal-Arroyo would be personally checking the clean-up operation in Guimaras Wednesday. She is also set to certify as urgent a bill strengthening and giving more teeth to environment and maritime laws to prevent a repeat of the oil spill in the future. "She thought it best to prepare legislation, among them, she announced her readiness to certify a proposed bill to prevent and give due punishment to those responsible for oil spills. So it's part of an overall package. And aside from that, our agencies continue to work in communities affected by the oil spill, including livelihood, medical treatment of those affected by the oil spill," said Press Secretary Ignacio Bunye. Bunye said the government is expecting oil companies and other firms engaged in the transport of oil and chemicals to start coordinating with government agencies concerned for the institution of necessary preventive measures. "The protection of the environment will always remain a top national priority," he added. OFFICIALS of a Paris-based organization that certified safety inspections on oil tanker M/T Solar 1 before it sank off Guimaras Island and triggered the worst oil spill in Philippine history snubbed anew a hearing of the Special Board of Marine Inquiry (SBMI) on Monday. This prompted one of the investigators, Commodore Benjamin Mata, to conclude that company officials could be "hiding something." The absence of Bureau Veritas officials forced the cancellation of the proceedings Monday morning. They were also invited to previous hearings but they did not attend. "There is a reluctance on their [Bureau Veritas] part to appear before this court. They must be hiding something," Mata told reporters. "It [absence] is to their disadvantage. There are questions that we wanted to ask them," he added. 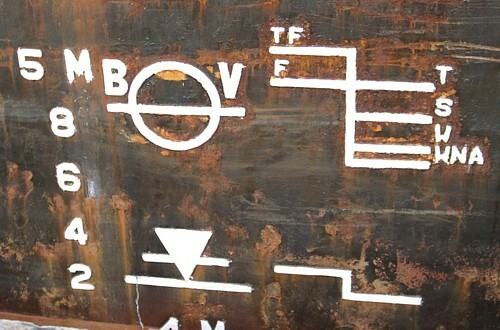 In past testimonies, the ship's crew and owners insisted that the checks made on the M/T Solar 1 were in accordance with international standards as certified by Bureau Veritas (http://www.bureauveritas.com.ph/). On Monday afternoon, the owner of the shipyard where the M/T Solar 1 had its last "drydocking" or general inspection, testified. Glenn Dela Torre, president of the Trigon Shipping Yard, told the SBMI that the vessel was of "high standards" as certified by Bureau Veritas. "Relatively, the structural integrity [of the ship] is of very high standards," Dela Torre said, adding, "It was seaworthy." Meanwhile, the SBMI chairman, Rear Admiral Danilo Abinoja, said the submersible from the Japanese salvage ship Shin Sei Maru has spotted a possible hole on a tank the left side of the ship. Abinoja, the vice commander of the Philippine Coast Guard, said investigators wondered why the ship listed to the right before it sank when there was a hole on the left side. Previously, investigators knew of holes only on the right side of the ship. Authorities are studying data collected by Shin Sei Maru to determine what to do with the M/T Solar 1 -- siphon off the remaining oil inside it or entomb or refloat the ship. Since it sank last August 11, the M/T Solar 1 has leaked some 1.3 million liters of bunker fuel into the sea, polluting beaches, fishing grounds, and marine reserves in Guimaras and portions of Iloilo and Negros Occidental provinces. 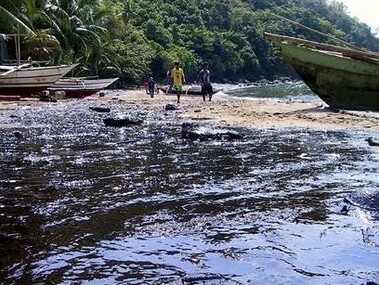 RESIDENTS who are living along the shoreline of Arevalo and Molo districts are now worried that the city beaches will be affected after the oil sludge has been spotted in six coastal villages here. Police Regional Office-Western Visayas director Geary Barias Friday made this confirmation after the Philippine Coast Guard informed him that some areas in the two districts are affected with the spill. The villages affected in Molo are San Juan, Boulevard and Calumpang while those in Arevalo, are Sto. Nino Sur, Sto Nino Norte, and Calaparan. The residents noticed a brownish greasy substance on the water. With this, fisherfolks and residents fear that their livelihood would be affected as well as the beaches. The City Government, through Mayor Jerry Trenas quickly acted to prevent the oil spill from the sunken M/T Solar 1 tanker to reach the city's waters. On the other hand, Barias said the residents have nothing to be alarmed of because "it's just only little amount of oil spill unlike in Guimaras." "Maybe it was carried away by the waves and there's no health hazard to the residents because of the small quantity," Barias said. Two days ago, Trenas confirmed that the municipalities of Oton and Tigbauan were affected. Dumangas Mayor Rolando Distura Friday said that number of areas affected along the coastal towns in northern Iloilo is the same. "I hope that it would not further damage other barangays (villages)," he said. Meanwhile, after admitting that the country is helpless in addressing accidents like the oil spill, Malacanang said they expect the cleanup to take a while along with the rehabilitation of the areas that have been affected. Press Secretary Ignacio Bunye said while they welcome recent developments identifying the source of the spill, it would still take some time before it is completely resolved. "The cause of the crisis is now in full view. We are well on the way of sealing any more leaks and offloading the oil as directed by President Gloria Macapagal-Arroyo. This may take a long time but we are confident that a comprehensive rehabilitation plan, supported by all stakeholders will mop up this spill," he said. His statement came at the heels of President Arroyo's admission that the Philippines is helpless in addressing accidents as big and as serious as the oil spill. The Philippines even needed the assistance of foreign countries in the cleanup as well as in the relief assistance for the affected places and residents. Bunye however assured that the government, through Task Force Guimaras, remains on top of the situation, including environment, health and justice issues. "The government will sustain all socioeconomic interventions until the communities are back on their feet. At the same time, this experience will leave us enduring lessons not to repeat this man-made calamity again," he said. He also assured that those found responsible, including those who may have been lax or too lenient in their duties, would be dealt with accordingly. Lieutenant Commander Harold Alder, Philippine Coast Guard station commander, assured residents of Iloilo that only oil sheen had been found in the coastal waters near the province's boundaries. He said the oil sheen would dissipate in due time as it is exposed to sunlight. Meanwhile, the government has barred the owners of Sunshine Maritime Development Corporation, including its four Japanese incorporators, from leaving the country amid the ongoing probe of the oil spill. Justice Secretary Raul Gonzalez Sr. issued a hold-departure order against Mototsugu Yamaguchi, Hiroyasu Yamaguchi, Tomoki Tsubomoto, Hiromi Irishika and their Filipino partners Dionisio Parulan, Gregorio Flores, Clemente Cancio, Roberto Mena and Angelita Buenaventura. Gonzalez directed Immigration Commissioner Alipio Fernandez to place them under the hold-departure list following reports that they have closed their local office since the incident took place. "They used to be just under the watch-list but now I issued an HDO because they have closed their local office. They can't be located by our process servers," he said. Gonzalez said the incorporators of Sunshine Maritime, which owns Solar I, may be held liable for civil damages in connection with the oil slick. It was also learned that one of the Japanese incorporators, Horoyasu Yamaguchi, is facing a perjury case before a Makati City court. "The President's marching order is to make a thorough investigation. We are looking for the more serious case so that we have more progressive results. Since we are investigating this, we might as well investigate every direction to ensure the conviction of guilty ones," he said. Cancio, the president of Sunshine Maritime; Nicasio Alcantara, chairman of Petron; Vice Admiral Arthur Gosingan, chief of the Philippine Coast Guard; and Solar I captain Norberto Aguro are set to testify in the inquiry to be conducted by the justice department's task force chaired by Undersecretary Ernesto Pineda. Ship crew Herminio Renger, radioman; Jesse Angel, pumpman; Reynaldo Torio and Victor Morados, both oilers, were also called to appear after the Board of Marine Inquiry found out that all four have expired General Tanker Familiarization certificates. THE SAFETY officer of the sunken M/T Solar I appeared to be clueless about the seaworthiness of the oil tanker, the head of the government fact-finding team looking into the sinking said Friday. Macario Macariola of the Sunshine Maritime and Development Corporation (SMDC) clammed up when asked difficult questions by members of the Special Board of Marine Inquiry (SBMI). The Solar I, owned by SMDC and chartered by Petron Corporation, was carrying some two million liters of bunker fuel when it went down in rough seas off Guimaras province on August 11. Since then, experts believe up to 1.3 million liters have leaked out from the tanker, one of the worst oil spills in the country’s history. "Apparently we are getting the impression that the safety officer (Macariola) does not have a very clear knowledge of the condition of the vessel," said Rear Admiral Danilo Abinoja, who chairs the fact-finding board tasked to investigate the circumstances surrounding the sinking. "Gulong-gulo ang isip nya (His mind is very troubled). He just came from Guimaras," Abinoja added. Macariola also "did not appear to have any sea experience" after he failed to submit documents to prove his qualifications, Abinoja said. Among the questions Macariola dodged were about whether he was aware Solar I captain Norberto Aguro was not a licensed oil tanker chief and whose license to command a chemical tanker had expired in 2002. He was also asked whether the Solar I was listing before it sank. He also evaded questions about why there were 20 people onboard the ship, including two surveyors, when it has a capacity of only 16. The wreck of the tanker Solar 1, which has been leaking oil since it sank off Guimaras Island on August 11, has been found, the Department of Environment and Natural Resources said on Thursday. Environment Secretary Angelo Reyes said two ships of the National Mapping and Resource Information Authority (Namria) had established the location of Solar 1 south of Lusaran Point in Guimaras. It was resting on the seabed at a depth 640 meters. Reyes said the tanker’s position was about five kilometers east of where it had sank. The coordinates have been transmitted to Shinsei Maru, a Japanese survey ship which would determine the condition of the tanker. Reyes said the Solar 1’s location was determined by the BRP Hydrographer Ventura and BRP Hydrographer Presbitero, which started their survey August 17. He said the two ships are equipped for conducting submarine topographic and geological surveys and locating sunken vessels and other potential navigational hazards. The Shinsei Maru sailed into port in Iloilo Wednesday night and at first light deployed off Guimaras. The ship’s mission is to deploy its remote-controlled submersible for a sonar sweep of the tanker, the Coast Guard chief, Vice Adm. Arthur Gosingan, said. “It will conduct a survey underwater to find out how the Solar 1 is lying on the seabed and whether remaining oil in its hull is leaking. It will check its position to determine what action to take,” Gosingan said. He said that from the ship’s findings, the Coast Guard will decide whether to refloat the tanker or siphon off its contents to prevent a further leak. A third, more costly option is to bury the entire ship in sand. “We expect the cleanup to take more than six months,” Gosingan said, adding that besides the Japanese ship, marine experts and biologists from the US, France and Australia as well as environmental groups were in the area. Solar 1, a single-hulled tanker owned by the Filipino-registered Sunshine Maritime Development Corp., sank in rough seas carrying some 500,000 gallons of industrial oil. About 50,000 gallons have leaked so far, damaging fertile fishing grounds, white sand beaches and hundreds of kilometers of shoreline. Two of the ship’s crew remain missing. As a result of the ecological disaster, oil tankers in Philippine waters will be required to be double-hulled. Maritime Industry Authority Administrator Vicente T. Suazo Jr. said a policy on double-hulled tankers will be submitted to the Marina board for approval next week. The International Maritime Organization requires all oil tankers operating in international waters to comply with the double-hull requirements by April 2008. “As of February 2006, Marina had already been in consultation with tanker operators on the requirements for ensuring that all oil tankers in the domestic trade are double-hulled,” Suazo said. “Some tanker operators have already started acquiring or negotiating to acquire double-hulled tankers,” he said. The Left-leaning Pambansang Lakas ng Kilusang Mamamalakaya ng Pilipinas scored the Department of Science and Technology for trivializing the Guimaras oil spill. Fernando Hicap, national chairman of Pamalakaya, said it was very irresponsible for the DOST to say that typhoons could help clean up the spill. “Why rely on typhoons? The DOST must be stopped from trivializing this issue for God’s sake. It is praying for supercalamities to get rid of superprofit-induced ecological disasters and this is foul. Give us a break,” he said. THE Philippine authorities have continued to ask for assistance in dealing with a sunken tanker lying in deep water off Guimaras Island in the central Philippines. Although local reports have been confused and even contradictory it is clear that a spill of heavy grade fuel oil has caused extensive pollution of sensitive ecosystems and that cargo remaining in wreck is escaping. The 1,998 gt ship was owned by Sunshine Maritime Development Corp and has been classed with Bureau Veritas since September 2000. The last special survey was carried out at Cebu & Manila in April this year and class certificates were issued without recommendations. Statutory certificates were issued by the flag state. NUEVA VALENCIA, Philippines : Coast guard officials struggling to contain a dangerous oil spill in the Philippines expressed frustration that a sunken tanker described by environmentalists as a "ticking time bomb" had yet to be raised. "What has got up our goat is that we hear a lot of talk about what should be done but nothing has happened. That ship sank over a week ago and officials are still talking," local coast guard commander Harold Jarder told AFP. Some 50,000 gallons of oil have already leaked from Solar I, which sank in rough seas on August 11 off the central island of Guimaras. The slick has covered 200 kilometers (125 miles) of coastline in thick black sludge, Jarder said. It is threatening marine reserves and extends 15 nautical miles from where the ship sank, he added. His comments about the country's worst-ever oil spill came as the owners of Solar I, which was carrying 500,000 gallons of bunker oil, said they were consulting with experts about raising the vessel. Clemente Cancio, president of the Sunshine Maritime Development Corp, told AFP the company was in talks with "international maritime experts" to see if the 998-tonne tanker could be raised. Two British experts from the International Tanker Owners Pollution Federation inspected the site on Friday, he said. The Philippines was awaiting their recommendations, he added, but he could not say when the assessment would be released. Civil defense chief Anthony Golez said the Philippines' request for assistance from foreign governments would be based on the recommendations. Golez said Philippine President Gloria Arroyo wanted the oil remaining inside the tanker pumped out and the vessel recovered. Cancio, however, said it might be unlikely the tanker could be recovered. According to the coast guard, the tanker rests on the seabed in 3,000 feet (900 metres) of water and is still leaking oil. Cancio said he did not know why oil was still leaking out of the tanker. "That is one of the things we have to find out," he said, adding that the crew of the ship said it was still in one piece when it went down. "The oil has to be contained," he said. He added the tanker was launched in 1988 and had just come out of dry dock in February and was certified seaworthy by the Paris-based organisation Bureau Veritas. Greenpeace's southeast Asian campaign director Von Hernandez warned that urgent efforts were needed either to raise the ship or to pump the remaining oil out of the stricken vessel's tanks. "The longer that tanker stays underwater, the greater the danger. What you are looking at is a ticking time bomb," said Hernandez. Jarder, who conducted an air survey of the area early Saturday, said he had six vessels working on the slick. "We are using booms to contain the oil and scooping it up for disposal. But we are trying to cut down on the use of dispersants," he told AFP. "At the moment the weather has been on our side but the real problem is still on the seabed," he added. On Guimaras island, small groups of residents busily continued shovelling the sludge off the blackened beaches in and around Nueva Valencia, one of the worst-affected areas. Petron Corp, which chartered the vessel, has placed booms along many of the beaches to hold the oil back. "We are just collecting the oil and putting it in plastic bags and stacking them on the beach," said local official Jeffrey Candecila. Relief agencies have begun handing out food to many of the hundreds of poor fishermen whose livelihoods have been put at risk by the spill. A minisubmarine inspecting the wreck of the Solar 1 on Friday found an open oil compartment and another one leaking small quantities of oil, the ABS-CBN News Channel reported. Capt. Luis Tuason, district commander of the Coast Guard in Western Visayas, told ANC the remote-operated vehicle (ROV) sent down by the Japanese survey ship Shinsei Maru saw that the hatch of the fourth compartment was open. The compartment is on the port (left) side of the sunken oil tanker. Tuason said the compartment could have already leaked 275,665 liters of oil. Another compartment on the port side was found broken and leaking small quantities of oil. The compartment could hold about 275,000 liters of oil. The remote-operated vehicle will continue probing the surface and parts of the sunken tanker until Saturday. The Solar 1 sank in rough seas off Guimaras on August 11. Tuason said Coast Guard personnel were spraying chemical dispersants on the waters above the tanker to prevent the leaked oil from spreading. The survey started after the ROV found the sunken ship lying 640 meters on the seabed some 7.8 nautical miles southwest of Unisan Island Thursday. Officials said the ship was found in an upright position. During Thursday’s initial survey, the ROV found a crack on the right side of the ship. ANC reported that the crack was in the third compartment of the ship, which also has a capacity of at least 275,000 liters of oil. Tuason said it was not clear if the oil in the third compartment had leaked. He said the Japanese survey crew was paid to survey the sunken tanker and make recommendations. The recommendations would be relayed to Coast Guard headquarters in Manila and studied by experts. Only then can it recommend a plan of action on the tanker. Petron Corp. signed a $20-million contract with Fukuda Salvage and Marine Works Co. Ltd. for the services of the salvage ship. Carlos Tan, Petron spokesman, said the ship will finish its survey in two to three days and would be able to come up with its findings in another two days. At Friday’s Special Board of Marine Inquiry into the sinking of Solar 1, an executive of Petron testified that the tanker had been shipshape and ready to sail. "Based on our inspection and the certificates submitted to us by the ship’s owners, we believe that the tanker was safe to sail," said Rolando Salonga, Petron’s distribution officer. Salonga, who was responsible for chartering Solar 1, said it was the first time Petron had hired a vessel from Sunshine Maritime Development. He said Solar 1, which was carrying with 2 million liters of bunker fuel, was only 98 percent loaded, a standard precautionary measure. Salonga said Petron had complied with all the standard operation procedures before Solar 1 began its voyage. The ship was checked out for soundness even before the bunker fuel was loaded. He could not explain, however, how the expired license of Capt. Norberto F. Arguro was overlooked. "We rely heavily on certificates issued by Bureau Veritas and the ship’s owners," Salonga said. In response to Arguro’s comments that he chose to set sail despite problems with the tanker and adverse weather because he did not want to lose the company money, Salonga said the contract had no provision that penalized late delivery. "If the vessel had encountered a problem in the voyage, it would be the ship master who had direct responsibility," Salonga said. "Any unusual activity during the voyage should have been reported to us, but we had no direct communication with the captain." SHIP Captain Norberto Aguro of the MT Solar 1, which caused the oil spill in some areas of Guimaras, said he was asleep when the accident happened. He revealed this during the initial investigation done by the Board of Marine Inquiry. Aguro said at the cabin he was in, one can't feel the ship's movements as well as the waves. He woke up only when the ship was already on its side. He also admitted that they were not able to secure weather information from the weather bureau. Meanwhile, an executive of Petron Corporation said they could not sued by any group. "We have a valid contract with the ship owner. Our legal liabilities are up to the Marine Board-Philippine Coast Guard which is presently conducting an investigation," Petron Chairman and Chief Executive Officer Nick Alcantara told the media Tuesday. Alcantara also expressed regret over the accident and assured the public that they will not leave its responsibility. Manager of Health Safety and Environment and representative of the corporation in the region, Carlos Tan showed in his report that the sunken vessel was 'seaworthy' if it is to be the focal point of argument. The vessel that has sank in August 11 and has now reportedly spilled more or less half million liters of oil, "being classed by Bureau of Veritas Quality International (BVQI), an international classification society for certifying the sea-worthiness of vessels." Such classification is a prerequisite for insurance coverage. The vessel was also fully insured as it stands as one of the members of Protection and Indemnity Club (P & I), an association of ship owners who agree to insure each other with respect to specified risks arising from the operation of their ships. The ship was insured of US $300 million, said Tan. This covers incidences such as that of the August 11, the pollution damage. Such were compensable damages to property, clean-up onshore and sea, economic losses incurred of fishermen and mariculture and to tourism and reinstatement of the environment. Further, Tan cited that the vessel was issued with a certificate of inspection from the Maritime Industry Authority (Marina). The PCG has inspected the ship before it has navigated. Tan further discussed that the vessel was carrying 2.19 million liters of bunker fuel or three percent less out of its carrying capacity of 2.24 million liters. The Provincial Government of Guimaras and the justice department expressed that they are open to filing case against Petron for the spillage of its 2.19 million liters of oil. Petron President Khalid Al-Faddogh said the encouragement of a boycott of their products here is unfair, as they have been doing their job. "This is an open market. The customers have the choice. But let the customers judge us according to our deeds." He added that Petron is not leaving the island and other affected areas for as long as their ecological wealth has not returned. Alcantara said, "Hindi tama na iboycott and produkto ng Petron. Hindi masisisi ang Petron sa nangyari. (It's not right that Petron's products be boycotted. Petron can't be blamed for what happened)." "It was an accident, President Gloria Macapagal-Arroyo even admitted so. Petron is number one in sales in the province. It has been marketing here for more than 40 years," he added. Dumangas Mayor Rolando Distura Tuesday called for a boycott of all Petron products. He made this urging after "the deadline given to Petron to take action has lapsed." The Iloilo Provincial Board felt no assurance that the vessel will be re-floated, thus decided to put in place its call of boycotting Petron's products. Alcantara said the price of oil will not be the defense mechanism, despite losses have been incurred. "The corporation has also incurred expenses on its relief operations but it remains insignificant," he said. As of now the spill has affected a total of 3,357 families only from the three out of the five towns in Guimaras-Nueva Valencia, Sibunag and San Lorenzo. The spill damaged a total of 220 kilometers of shoreline, 454 hectares of mangrove and 58 hectares of seaweed farms. Petron has conducted clean up operations three days after the spill after it has made and aerial survey on August 12. Tan underscored that Petron has been carrying out its obligation to the spill by implementing a "Cash for Work" program where the present 1,200 working men for the clean up operations will be paid P300 from the earlier P200 pronouncement. This pay is not compensation but relief assistance, said Tan. The paying insurance company has deployed men to conduct workshops among the affected people of Guimaras on how to file claims and pays. P & I is keen to evaluate claims and make reimbursements without delay, Tan said. The P & I and its partner, International Oil Pollution Fund, have tasked the Seven Adjusters as its focal point for receiving all pollution damage and claims. Executive Director of the Petron Foundation Malu Erni said there were already three villages cleared from the spill. They are Canhawan, Igdarapdap and Dolores, which were "cleaned up completely." As of now there are 80 hectares cleaned-up with a total of 516.40 metric tons of oil debris collected, said Erni. The transfer site of the debris now collected in Nueva Valencia, Guimaras is being coordinated with the Provincial Government of Guimaras and the DENR. Tan said while the disposal site in Guimaras is temporary, safety considerations were considered that the design of the site will be made plastic lined-and control of leachate. Petron is now coordinating with a waste processing facility, Holcim Philippines to buy the debris as secondary fuel. To re-float the ship, insurance company of the owner of the sunken vessel -Sunshine Maritime Development Corporation (SMDC) has hired Fukada Salvage and Marine Works Co. Ltd., a Japanese shipping firm. Its ship, Shinsei Maru with a remote operated vehicle (ROV)-Hakuyo 200, that will determine the extent of the ship's damage, will come to the sunken area Thursday if the weather permits. It left Okinawa, Japan last Saturday, 1 p.m. Philippines time. Western Visayas Police Director Geary Barias, on the other hand, said lifting the vessel from the belly of Guimaras Strait is not a problem for Petron, because it (tanker) was already located by the satellite use by the National Mapping and Research Administration (Namrea) of the Department of Science and Technology (DOST). As its long-term goal in guarding against the occurrence of the same incident, Petron revealed that it is procuring modern and newer vessels carried under its project "Shipping Alliance". These vessels chartered through this will have double-hulled and double-bottoms. This was in line with the International Maritime Organization's (IMO) requirement by 2008. Drusila Esther Ong, officer-in-charge of the Bureau of Fisheries and Aquatic Resources (Bfar) Western Visayas, said they have already tested the waters in at least 12 barangays where there is an oil spill, sheen or sleek. The Bfar had also tested the fishes from those barangays and found that the fishes remain safe to be eaten. She said it is the shellfish, crabs and other sea creatures that live in burrows that are affected and are not fit for consumption. Ong said while there may be an oil spill, fishes from the open sea are safe as they can move around and evade being affected by the oil spill unlike shellfishes and other sea creatures that lives and may even be stuck in the burrow. She said they have conducted the testing weekly and are set to make new tests, especially those involving the sea creatures on Wednesday. She said they use at least one kilo of fish and other sea products from each barangay for their tests. Ong said they would start sending their samples and test results to the Bureau of Food and Drugs (Bfad) for additional testing. Health Secretary Francisco Duque III, for his part, recommended for the relocation of children, elderly and pregnant women from the oil spilled-contaminated areas following the reports that prolonged exposure to "alarmingly high" toxic components is not safe. "We shall be recommending the relocation of children, elderly, and pregnant women from the oil spill contaminated areas if repeated ambient air monitoring continues to be poor which may significantly affect their health condition," said Duque. Duque said monitoring conducted by the Department of Health (DOH) last August 27 in three selected areas showed elements of bunker oil exceeded the minimal risk levels and that levels of benzene, ethylbenzene, toluene, xylene and hydrogen sulfide were found to be high. He said the physical effects of the oil slick may range from the milder skin irritation to severe and chronic cases such as cancers and leukemia. So far, Duque said there is only one recorded casualty, a 26-year old male who died of myocardial infarction last August 16 while four others were hospitalized due to various oil spill-related diseases. MANILA -- Four Japanese nationals and five Filipino incorporators of the Sunshine Maritime Development Corp., owner of motor tanker Solar 1 that sank off Guimaras and caused a massive oil spill, were placed under the watch-list of the Bureau of Immigration (BI). In a memorandum to Immigration Commissioner Alipio Fernandez Jr., Justice Secretary Raul Gonzalez Sr. ordered that Mototsugu Yamaguchi, Hiroyasu Yamaguchi, Tomoki Tsubomoto, Hiromi Irishika and their Filipino partners Dionisio Parulan, Gregorio Flores, Clemente Cancio, Roberto Mena and Angelita Buenaventura be included in the watch-list. On top of possible reckless imprudence charges, the nine are also the subject of an investigation for a number of violations in connection with the oil spill that resulted from the sinking of MT Solar 1 on August 11 due to bad weather. "In the interest of the public and so as not to frustrate the ends of justice, you are hereby directed to include in the bureau's watch-list the following names, which are subject of investigation for violations of the Clean Water Act, Anti-Dummy Law, Corporation Code, Domestic Philippine Act, Revised Penal Code and the Brown Environmental Law," Gonzalez said. The newly formed Department of Justice (DOJ) special task force has issued summons to Cancio, president of Sunshine Maritime; Nicasio Alcantara, chairman of Petron; Vice Admiral Arthur Gosingan, chief of the Philippine Coast Guard; and Solar 1 captain, Norberto Aguro. Ship crew Herminio Renger, radioman; Jesse Angel, pumpman; Reynaldo Torio and Victor Morados, both oilers, were also called to appear after the Board of Marine Inquiry (BMI) found out that all four have expired General Tanker Familiarization certificates. All were directed to appear before an inquiry to be held on Monday at the DOJ executive lounge before Justice Undersecretary Ernesto Pineda, who chairs the task force. But sources said the four Japanese incorporators have already left the country or were outside the country when the oil spill took place. Gonzalez said the names of the Japanese executives were gathered by investigators from the articles of incorporation of the shipping company, wherein it was learned that they provided P4 million of the P5 million start-up capital of the shipping company. He said if this was true, this would make the incorporators liable under the Anti-Dummy Law, which provides that "any person, corporation, or association which, having in its name or under its control, a right, franchise, privilege, property or business, the exercise or enjoyment of which is expressly reserved by the Constitution or the laws to citizens of the Philippines or of any other specific country, or to corporations or associations at least sixty per centum of the capital of which is owned by such citizens in any matter." The DOJ panel was tasked to determine, among others, the seaworthiness of the vessel, the validity of the captain's license, and the movement or direction of the ship before it sank. Gonzalez gave the investigating team 30 days to submit its report and recommendations. The oil spill, considered the worst ever in the country's history, occurred after Solar I, a Philippine-owned tanker hired by Petron, sank off the island of Guimaras in Iloilo on August 11 while carrying at least 2 million liters of bunker fuel. JUSTICE Secretary Raul Gonzalez has ordered the Bureau of Immigration (BI) to put on its watchlist incorporators of Sunshine Maritime Development Corporation (SMDC), which owns M/T Solar 1 that sank off Guimaras Island, causing one of the worst oil spills in the country. Dionision Z. Parulan, Gregorio M. Flores, Clemente GR. Cancio, Mototsugu Yamaguchi, Hiroyasu Yamaguchi, Tomoki Tsubomoto, Hiromi Irishika, Roberto D. Mena, Angelita S. Buenaventura have been put on the list for possible violations of the Clean Water Act, Domestic Philippine Act, Revised Penal Code, Brown Environmental Law, and the Anti-Dummy Law, Gonzalez said. Gonzalez said records of the Articles of Incorporation and other records of the SMDC showed that majority of the incorporators of the company were Japanese. At the same time, the task force created by Gonzalez has summoned Clemente Cancio, SMDC president; Nicasio Alcantara, chairman of Petron Corporation; Norberto Aguro, Captain of M/T Solar I; Vice Admiral Arthur Gosingan, Philippine Coast Guard Chief; and the crew of M/T Solar I -- Herminio Renger, radioman; Jesse Angel, pumpman; Reynaldo Torio and Victorio Morados, oilers, to appear before the Department of Justice on Monday at 2 p.m. ABOARD THE EDSA II, Philippines (AFP) - A sunken tanker responsible for the Philippines' worst environmental disaster is leaking less oil, but the slick it caused has reached the country's richest fishing grounds, the coastguard has said. Daniel Gayosa, who is commanding the search and rescue vessel EDSA II at the wreck site, told reporters on Wednesday the sunken 998-ton tanker, Solar 1, was leaking "less than 10 liters" of oil per day. This compared with about 500 liters per day shortly after it sank in extremely deep waters south of Guimaras island on August 11. "We still don't know if there is still oil in there. Those tanks are also watertight and it's possible some of them are still intact. (But) we still don't know their status," Gayosa said. He said the oil that had leaked was "down to a sheen" two weeks after black sludge contaminated hundreds of kilometers of coastline and damaged a large marine reserve in Guimaras. He added that since the oil had thinned it would not cause as much damage as before. EDSA II was pressed into emergency duty after Solar 1 sank and has identified a near 20-nautical-mile (23-mile) slick from the wreck site towards the Sulu Sea. There are now reports of oil in the Visayan Sea. It and the Sulu Sea comprise the Philippines' richest fishing grounds. The coastguard and private vessels had been trying to contain the oil slick within the Guimaras Strait to prevent it spreading to the two fishing grounds. The authorities have fought the spill with containment booms and chemical dispersants for two weeks, while waiting for advanced equipment to raise the tanker or remove its remaining 450,000-gallon cargo of bunker oil. Meanwhile the Japanese survey ship Shinsei Maru arrived in the central Philippine city of Iloilo Wednesday. The ship, dispatched by the Fukuda Marine and Salvage Company, will send a remote-controlled submarine to inspect Solar 1, said Carlos Tan, a spokesman for local refiner Petron Corporation. The survey vessel will determine the location, position and condition of the sunken tanker. A decision will then be taken on whether to refloat the vessel, siphon out the oil or bury the tanker. Separately, a Manila-based inquiry into the disaster was told that the Solar 1's captain may not have been qualified to command oil tankers. Clemente Cancio, president of the Sunshine Maritime Development Corporation, Solar 1's owner, conceded that Captain Norberto Aguro did not have a license as master mariner of an oil tanker but instead had a license to pilot chemical tankers, although this license had expired in 2002. "We believe a chemical tanker is more dangerous than an oil tanker," he told the inquiry. He said Aguro "was performing well, his credentials were in order," although Petron Corporation had reprimanded Aguro several times in the past for docking without tugboat assistance. Aguro had previously admitted that he had sought refuge from bad weather at a port in Iloilo on August 10 but had gone out to sea on August 11. Aguro was "given the discretion of whether or not to proceed," Cancio said. Asked if the captain had made a mistake, Cancio replied that "in hindsight sir, I would say he made the wrong decision." Justice Secretary Raul Gonzalez directed the immigration bureau to place Sunshine Maritime's nine directors, including Cancio, on a watchlist to prevent them from leaving the country. The directors include four Japanese nationals. Manila - Australia and France have pledged to help the Philippines clean up a massive oil spill from a sunken tanker, President Gloria Macapagal Arroyo said on Monday. Arroyo thanked the United States and Japan for sending experts to help deal with the spill, which has contaminated resorts, marine reserves, seaweed farms and fishing communities on the southern coast of Guimaras island and outlying areas. Officials will appeal for more foreign assistance, she said, adding that Australia and France have offered help. She did not elaborate on the specific aid that both countries might provide. Solar I, carrying about two million litres of bunker oil, sank off Guimaras on August 11 in rough seas, then began spilling oil that has affected a 220km stretch of coastline. An investigation will pinpoint criminal liability and come up with ways to prevent a recurrence, Arroyo said. "There will be a wide-ranging investigation to find out what happened, who was responsible and what steps (are) needed to be taken to ensure this accident would never happen again," Arroyo told the Radio Mindanao Network. Traces of oil have been carried by the currents to the shores of two towns in Iloilo province, about 50km west of Guimaras, coast guard officials said. The Guimaras provincial government has reported that more than 26 000 people - directly and indirectly dependent on fishing - have been affected. Environment Secretary Angelo Reyes said the tanker has been located about 700m under the sea. Officials will wait for a Japanese salvage ship to arrive later this week and examine the tanker with a remote-controlled probe before deciding what to do next, he said. "We have to do this quick because some people say it's a disaster again waiting to happen," Reyes told ABS-CBN television. Arroyo, who visited Guimaras on Saturday, said she would return to the island later on Monday to check on the progress of a large-scale cleanup and steps taken by officials to safeguard the health of villagers living near contaminated shores and help them find other sources of income. "I want to make sure that the oil still gushing out of the vessel would be stopped, the remaining oil removed and this disaster would end," Arroyo said. Initial findings from a Board of Marine Inquiry investigation of the Aug. 11 oil spill in Guimaras reveal that the safety management certificate of Solar 1, the ship that figured in the disaster, had already expired. Moreover, the board suspended the ship’s captain Norberto Aguro for failing to undergo oil tanker training and management. BY KARL G. OMBION AND RYAN B. LACHICA Bulatlat BACOLOD CITY ? Initial findings from a Board of Marine Inquiry investigation of the Aug. 11 oil spill in Guimaras reveal that the safety management certificate of Solar 1, the ship that figured in the disaster, had already expired. The board also suspended the ship’s captain Norberto Aguro for failing to undergo oil tanker training and management. Marina has ordered the immediate grounding of the two sister vessels of oil tanker M/T Solar 1. Arnie Santiago, acting enforcement manager of Marina in Manila, identified the two sister vessels as Solar 2 and Solar 3. “We will not allow them to operate until the probe on the sinking is over,” he said during the Regional Disaster Coordinating Council (RDCC) 6 meeting here. The Board of Marine Inquiry, an agency under Marina, likewise recommended the filing of administrative charges against Aguro and the Sunshine Maritime Development Corporation, pending further investigations. Meanwhile, despite the claims of the government and local RDCCs that the Philippines is a disaster-prepared country, disaster-preparedness has been the least of priorities of this government, commented environmentalist activist and mining engineer Efren Fabila. Fabila said government particularly Coast Guard has not been serious in addressing the causes of countless disasters in the country. “That is why we keep on having disaster after another at the expense of our environment and people,” he said. Fabila recounted the grounding of National Power Corporation (Napocor) Power Barge 106 off the coast of Semirara Island in Caluya, Antique, eight months ago, after suffering hours of battering from strong winds and waves. “It spilled more than 200,000 liters of bunker fuel, affecting hundreds of hectares of shoreline around Semirara and neighboring shores; and millions of pesos are being spent for the clean up and rehabilitation of the affected areas, unfortunately, the job remain unfinished today,” Fabila said. He also blamed the Coast Guard and the local ports authority for not giving right information and precautions. “The tanker should not have been allowed to sail given the storms last week wrecking havoc throughout the country. They should have learned from the Semirara disaster and countless other disasters that had shaken our country in the past years like the Negros Navigation Dona Paz and M/V Cassandra,” he said. Just a day before the oil tanker ship disaster, central Philippines had been battered by two successive storms, bringing untold flashfloods and wind battering, damaging agriculture, properties and lives worth tens of millions of pesos. Worse, people were caught flat-footed as the Philippine Atmospheric, Geophysical and Astronomical Services Administration (PAGASA) did not raise any storm signal over the Western Visayas. As fast as the destructive storms that came and left, so was the sinking of the 998-ton locally registered M/T Solar 1 oil hauler, owned by Sunshine Maritime, an oil hauler for petroleum giant Petron Corporation, off Guimaras strait afternoon of Aug. 11. The tanker left Limay town in Bataan on Aug. 9 en route to Sangali town in Zamboanga del Sur, southern Philippines. It was contracted by Petron to ship two million liters of bunker fuel to the Western Mindanao Power Corporation. Region 6 Coast Guard investigations showed that early in the morning of Aug. 10, crew members had already noticed that the ship’s chain locker, the compartment that holds the anchor, had taken in water and the ship itself had begun to lean by about six degrees to the right. Despite this, Aguro gave the order to sail toward Iloilo. Then at around noon while traversing Iloilo strait toward open sea to Zamboanga, the ship leaned further to around 10 degrees. At around 4 p.m., Aguro made a right turn to Iloilo when the ship was already badly leaning right with its head down. He gave an order to abandon ship at 16.6 miles southwest of Lusaran Point in Nueva Valencia town, Guimaras island. Seventeen crew members including Aguro and two surveyors made it to the shore while two others, Victor Morados and Art Ian Nabua, failed to jump off to the sea. They remain missing. national marine reserve in Nueva Valencia, at least 4,000 fishermen and 17,000 households in several coastal villages. The oil slick also threatens more coastal villages of central Negros particularly those in Bago City and Pulupandan, Valladolid and San Enrique towns. The mayors of Pulupandan and Valladolid have reported imminent threats to their shrimp industries. They are at risk of losing millions of pesos from the possible damage, they say. Before this, Pulupandan Mayor Luis Mondia said that the shrimp industry in his town has already suffered about P50 million in losses caused by the bad weather and typhoons. It is likely to suffer more with the threat of oil spill contamination. Similarly, Valladolid Mayor Ricardo Presbitero, Jr. also said that the shrimp industry in his municipality suffered millions of pesos in losses. “It would take us more than two years to rehabilitate the industry,” he said. Gov. Joseph Maranon of Negros Occidental said he has already given advisories to the local government units (LGUs) most likely to be affected. He also said that the coastguard was immediately mobilized to assess the situation. The Coast Guard with the help of Petron has created Oil Spill Combat Teams (OSCT) to prevent the oil spill from spreading. Maranon said he will ask Petron for its counterpart in the cleaning program to be organized by the provincial government and the LGUs. The clean-up is estimated to cost about P2.2. By Leo Solinap JORDAN, Philippines (Reuters) - A Japanese salvage ship hired to help clean up the Philippines' worst oil spill has developed mechanical problems, delaying its scheduled Saturday arrival by at least three days, officials said on Friday. The ship was now expected to arrive on Tuesday after repairs to its crane, Coast Guard spokesman Lieutenant Joseph Coyme said. More than 40,000 people and 200 km (120 miles) of coastline have been affected by the spill of industrial fuel after a tanker chartered by oil refiner Petron Corp. sank in heavy seas off the central island of Guimaras on August 11. At least a 10th of its cargo of 2 million liters of bunker oil initially gushed out, polluting beaches and a marine park with black sludge, but there have also been signs of fresh leaks from the sunken tanker. The 998-tonne Solar 1 is believed to be lying 640 meters (2,100 feet) under water off Guimaras island, beyond the reach of Philippine divers. The developing Southeast Asian country also lacks the heavy equipment to reach the tanker. "We need to determine the exact location and condition of Solar 1 so we can decide whether to siphon the oil, lift the ship entirely with the remaining fuel or entomb the tanker using cement or sediment," said Carlos Tan, Petron's health, safety and environment manager. The Japanese salvage ship has equipment that provides images of the ocean floor from a remotely operated vehicle. The cost of its mission will be paid by the insurance firm of the tanker's owner, Sunshine Maritime Development Corp.
An inquiry into the ship's sinking has called on Sunshine to explain why Solar 1's captain was allowed to sail without any advanced training on oil tanker operations. The captain's license was revoked earlier this week. Petron, in which the Philippine government and Saudi state oil firm Saudi Aramco each have a 40 percent stake, has been criticized for the pace of its response to the disaster. But Petron, the country's largest oil refiner, has insisted it is doing everything possible to contain the spill and help the residents of coastal areas cope by hiring them to clean beaches and mangrove trees. Shares in the company finished down 3.85 percent at 3.75 pesos on Friday. The stock has shed 11 percent over the past two weeks. President Gloria Macapagal Arroyo ordered drop-off centers for human hair and chicken feathers to be set up in response to a call by the Coast Guard on Thursday for absorbent material to help soak up the spill. "This is a national calamity that demands the cooperation and solidarity of all Filipinos," said Arroyo, who is scheduled to visit Guimaras on Saturday. "Let us do what has to be done first and deal with the blame later." The municipal governments of Concepcion, Ajuy and Barotac Nuevo in Iloilo province put the towns under a state of calamity on Friday to speed up the release of funds for the cleanup. Guimaras island had already been declared a calamity area due to the effects of the slick on 20 fishing villages, its tourism industry and the mangrove trees and coral reefs of a marine reserve. Environmental groups said the spill also threatened the endangered giant clams at the Sagay Marine Reserve off the nearby island of Negros. 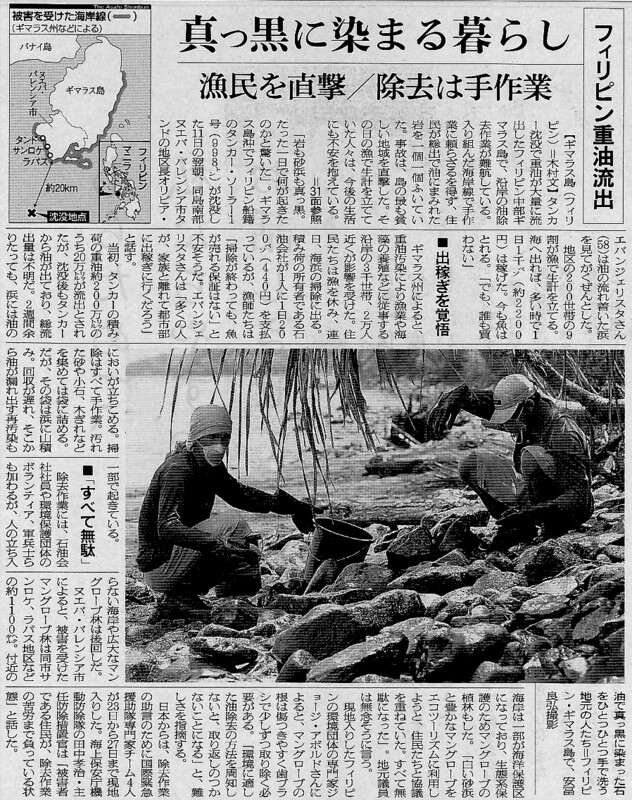 "These are the last of the endangered giant clams of the Visayan Sea," marine biologist Angel Alcala told the Philippine Daily Inquirer newspaper. Manila, Philippines (AHN) - Philippine oil refiner Petron Corp. has been charged a $1.9 million bill to account for the initial cost of cleaning the disastrous oil slick from its sunken tanker. 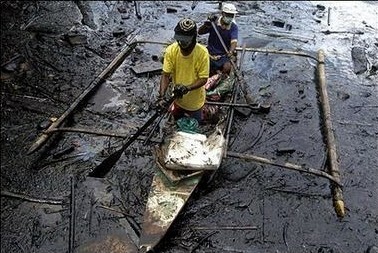 The incident is considered the Philippine's worst oil slick case. "We demanded a bond of 100 million pesos from Petron," said Vice-Admiral Arturo Gosingan. The vessel had gone during bad weather on August 11 near the central island of Guimaras. Gosingan told ABS-CBN television that between 200 and 300 liters of oil is still leaking per hour. "What we are going to do is scoop it" out of the water, Gosingan added, saying that the coastguard had already been spraying dispersant on the slick. Petron spokeswoman Virginia Ruivivar rejected reports of a continuing leak from the ship. "The evidence points that the vessel has ceased to leak and what we are seeing is the initial 200,000 liters that came from the damaged portion of the vessel," she said. She said the company had tasked an expert to make an assessment of the tanker which is 3,000 feet underwater. The spilled oil has destroyed beaches, reefs and marine reserves. Ruivivar said, "we are willing to spend to correct the situation," but questioned the claim that Petron could be held responsible for the worst such oil spill in the country's history. "I'm not sure about being partially liable," she said. She also refuted allegations the vessel was not fit for carrying such a cargo, saying "we have full confidence that the vessel was seaworthy when it left our refinery. It was bad weather, rough waves. NUEVA VALENCIA: Environmental watchdog Greenpeace said yesterday it was "shocked" by the extent of damage caused by the Philippines' worst ever oil spill and called on the government to treat the raising of a sunken tanker as a matter of urgency. "It's really bad out there," Athena Ballesteros, climate and energy campaigner for Greenpeace International, told AFP. "The extent of damage to such a wonderful part of the Philippines shocked us all. "The government must treat, as a matter of urgency, the raising of the tanker before more damage is done," she said. Some 50,000 gallons of oil has leaked from the tanker Solar 1 which sank on August 11 off Guimaras island in the central Philippines. The tanker was chartered by Petron, which is part government owned. Resting on the seabed with some 450,000 gallons still in its hold the tanker has been described by environmentalists as a ticking time bomb. Oil has contaminated 220 kilometres (136 miles) of coastline and destroyed 454 hectares (1,121 acres) of mangroves and 58 hectares of seaweed farms, Guimaras governor Joaquin Rahman Nava said at the weekend. He said the spill had also destroyed the livelihoods of thousands of people dependent on fishing for a living. Nava described the island province as a "gem" with its long stretches of white beaches, clear seawater and rich marine life. "Over years, we have devoted a sizeable chunk of our development fund to the improvement of our coastal treasures, from projects in coastal resource management, mangrove reforestation, seaweed, pearl and shellfish industries," he told local media. "What has taken us decades to build up has been destroyed overnight." Greenpeace, which is conducting an environmental impact study for the coastguard, concentrated much of its research yesterday on the Taklong Marine Reserve in the south of the island, which has been badly affected by the spill. Covering some 1,143 hectares, the park is home to a rich variety of mangroves and marine life. Two areas of mangroves were totally covered in sludge. Greenpeace says it will take several months to draw up its report on the full environmental impact of the spill. "The real problem still rests underwater and until that is removed the danger has not gone away," Ballesteros said. A Manila newspaper yesterday said the captain of the tanker was not properly trained to handle the ship. The findings of a preliminary investigation by the Maritime Industry Authority showed he did not have "advance training on oil tanker operations," according to a report in the Philippine Daily Inquirer. A team using robotic submarine equipment plans to inspect a sunken tanker that has leaked oil and wreaked environmental havoc across fishing villages and mangrove swamps. The Luxembourg-based insurer of the sunken Solar 1 has pledged to ship the equipment from Singapore in a few days after it appoints a salvage company that will undertake the deep-sea inspection and possibly the retrieval of the tanker, Coast Guard Capt. Luis Tuason said. Tuason said the robotic equipment could take photographs of the tanker and guide authorities on their next steps. Coastguard commander Harold Jarder told AFP that the slick, stretching 15 nautical miles, was slowly being carried by ocean currents into the Guimaras Strait opposite the sugar-growing island of Negros. "At present Negros is not directly affected," he said. On land, hundreds of villagers were trying to mop up the slick with improvised tools such as bamboo poles, rice straw, dried grass, used sacks and even clothing. At sea and off beaches booms have been erected to contain the oil which is scooped out and taken away for disposal. President Gloria Arroyo on Saturday said the government had sought the help of the United States, Japan and Indonesia to try and refloat the tanker which is lying in 900 metres (3,000 feet) of water. "The government has already sounded off the alarm to foreign governments, including Indonesia, the United States and Japan, to help refloat the sunken tanker," she said in a statement.